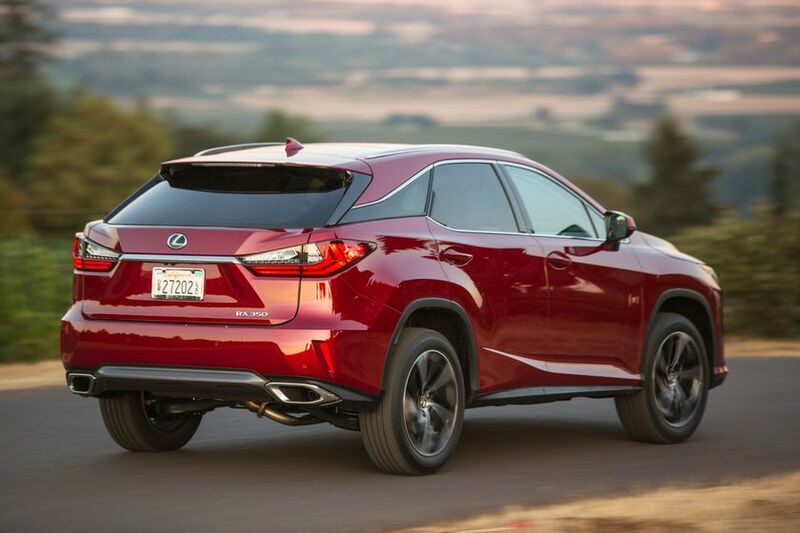 (TORONTO, ON – September 8, 2015) It’s the best-selling Lexus in Canada – and it’s about to get even better. 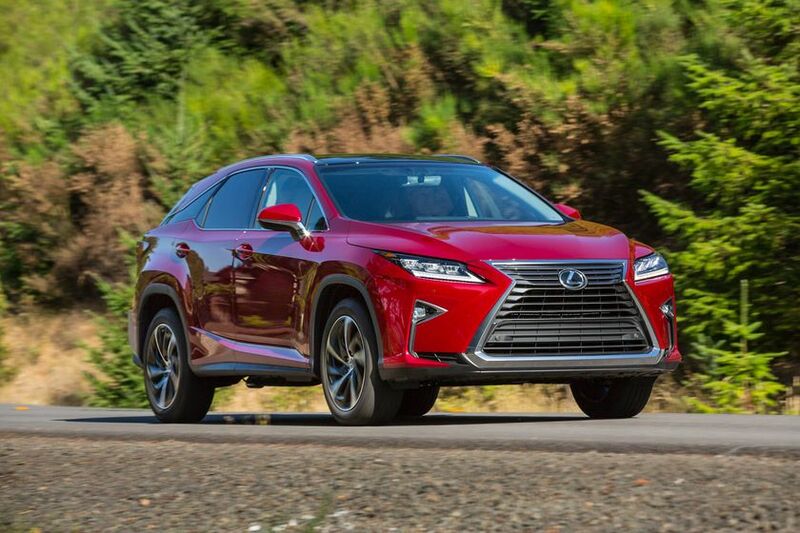 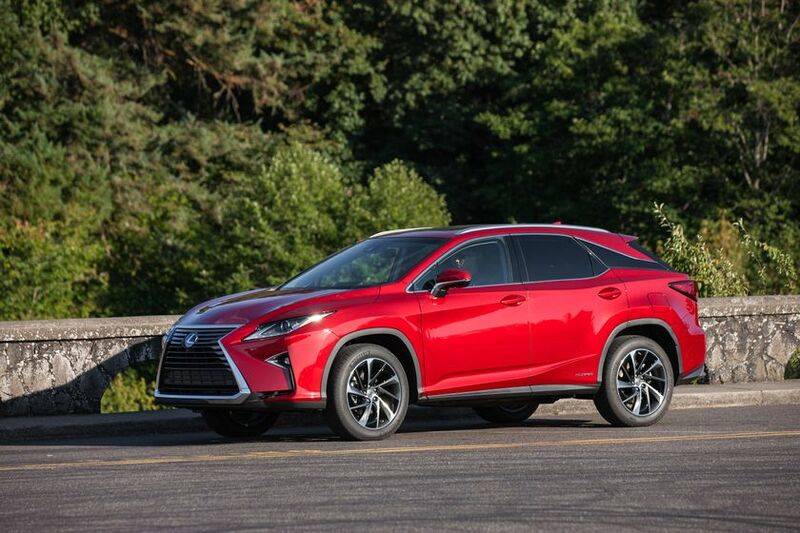 In fact, Lexus is reinventing the luxury crossover category, the very category that it helped to pioneer almost 20 years ago, and the all-new 2016 Canadian built Lexus RX is indeed the best RX yet. 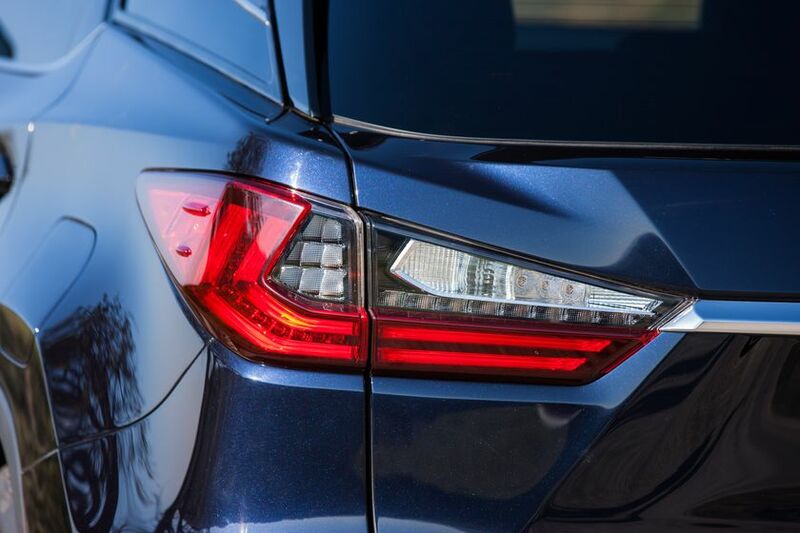 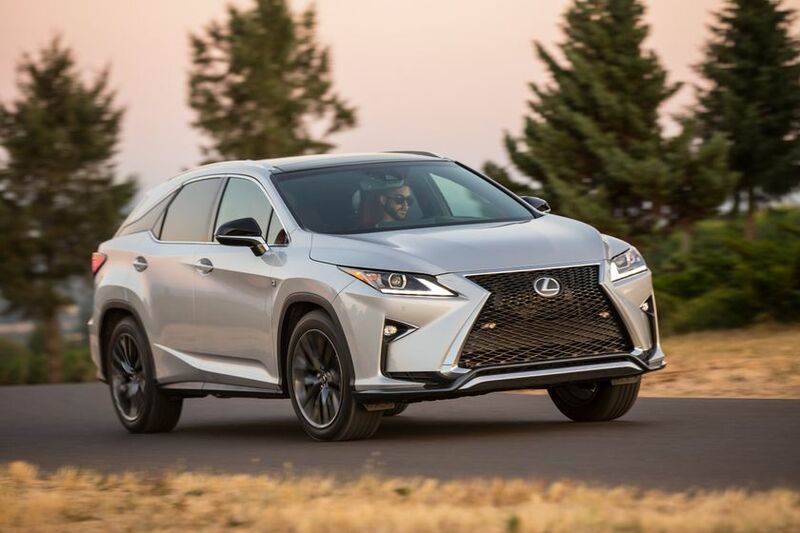 The fourth generation Lexus RX has been designed and engineered to surprise beyond expectations – with seductive styling, inspiring innovation, and dynamic performance. 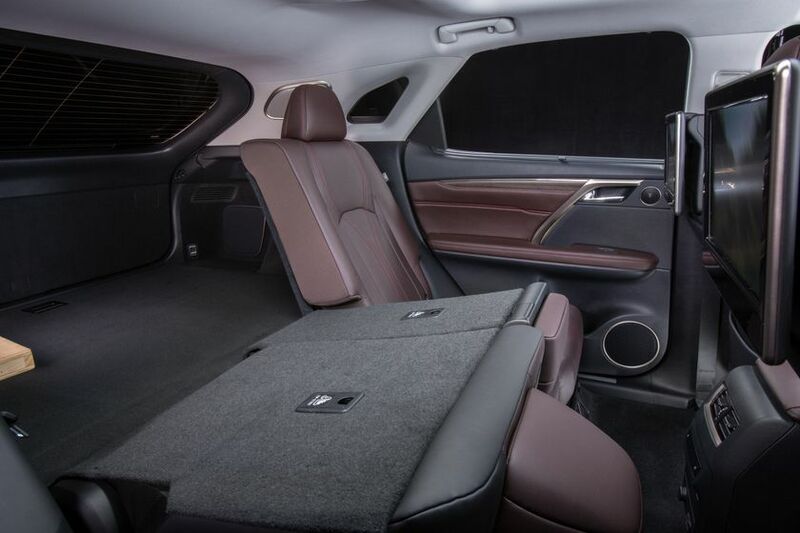 The result – a luxury crossover combines the flexibility of a sport utility vehicle with the driving comfort of a luxury sedan, wrapped in an elegant and sophisticated package – luxuriously equipped with smart technology and comfort features that deliver an intuitive, worry-free experience, every time. 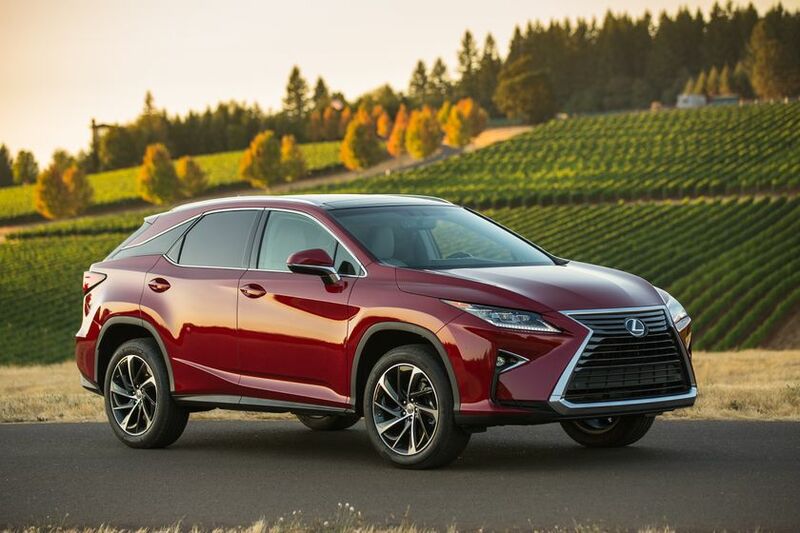 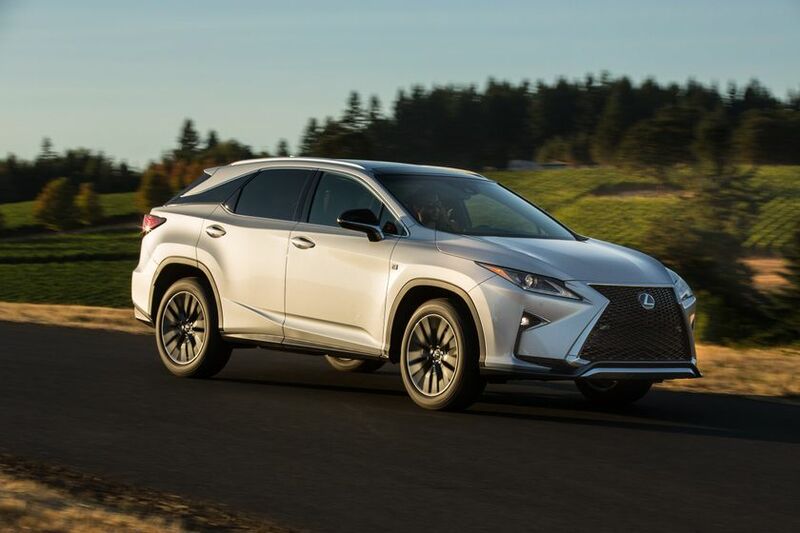 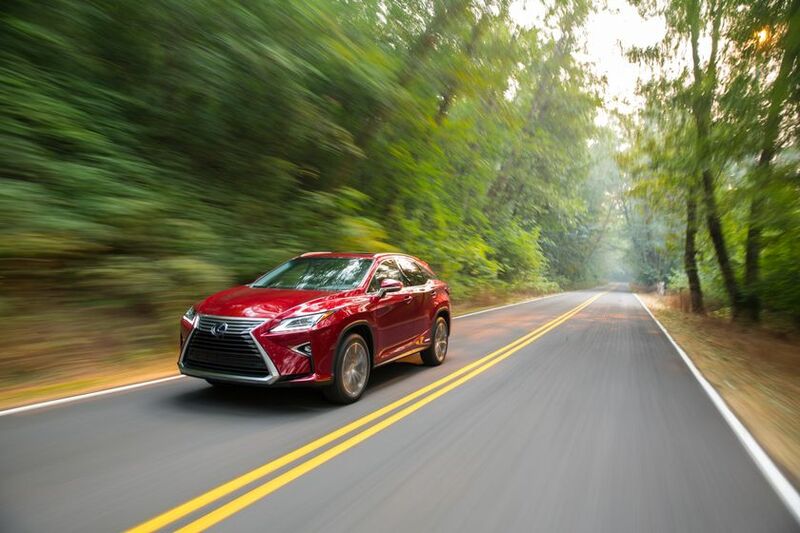 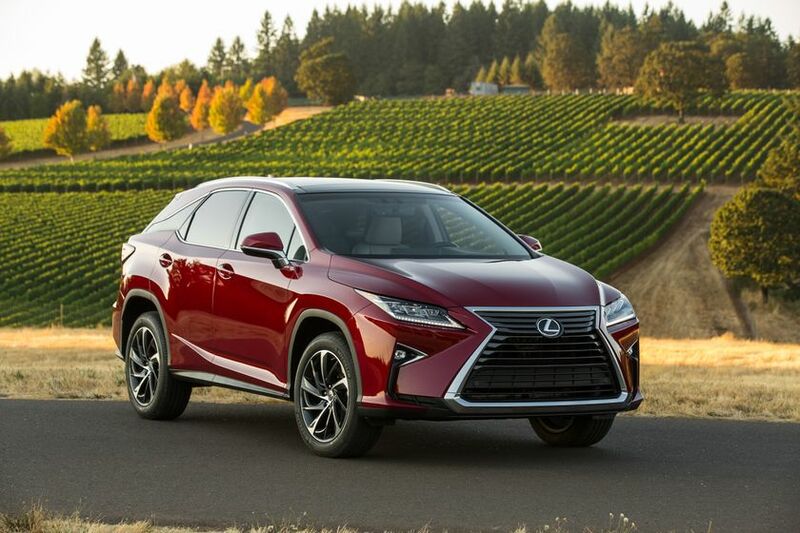 The RX 350 features a redesigned power train, built around an eight-speed automatic transmission and enhanced 3.5L V6 engine that delivers more horsepower and torque than previous models. 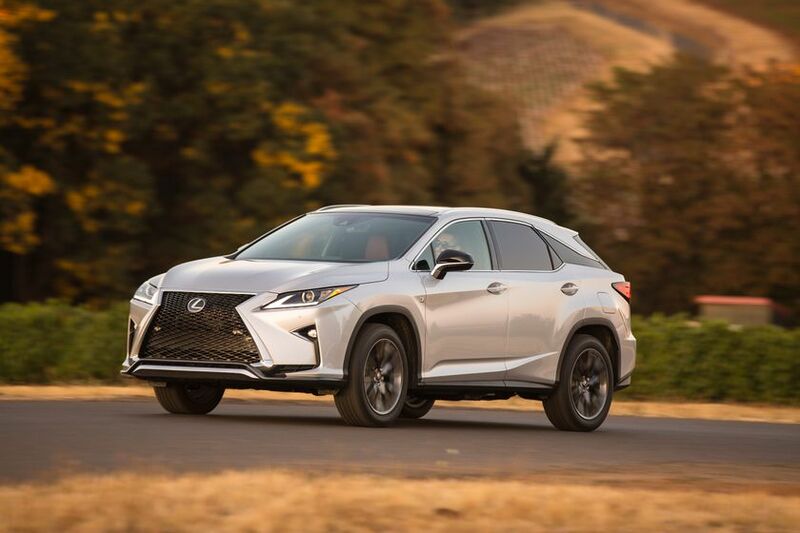 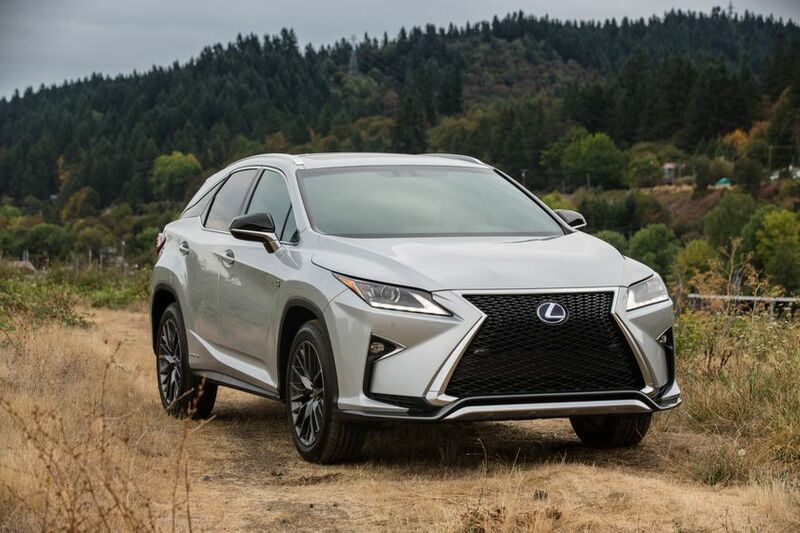 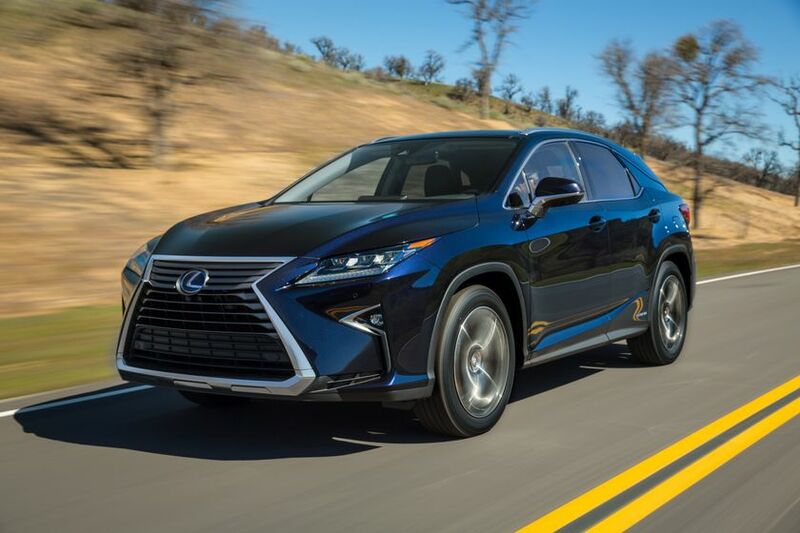 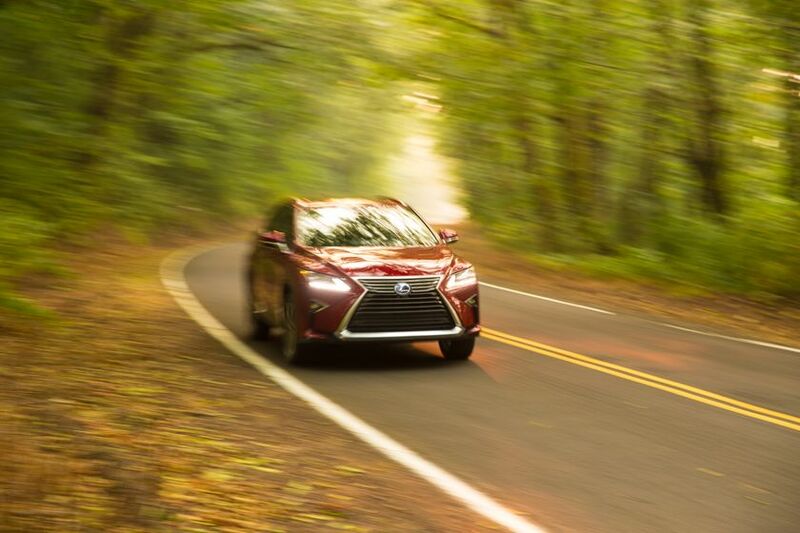 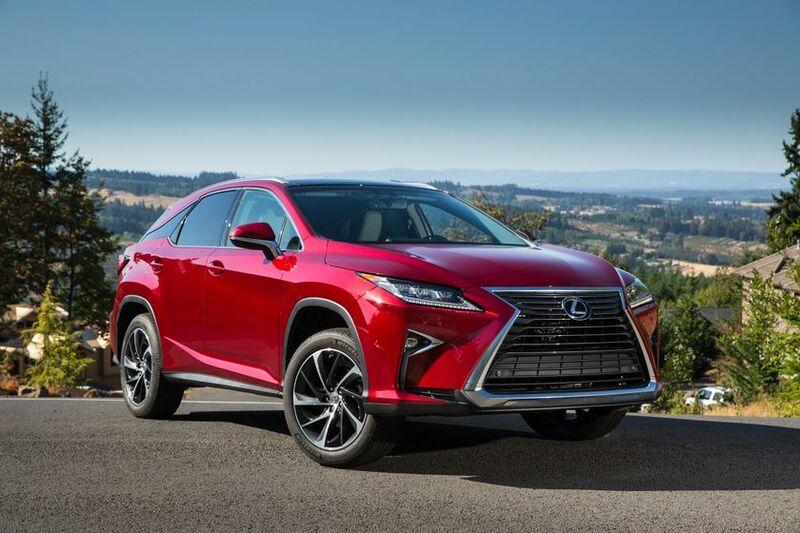 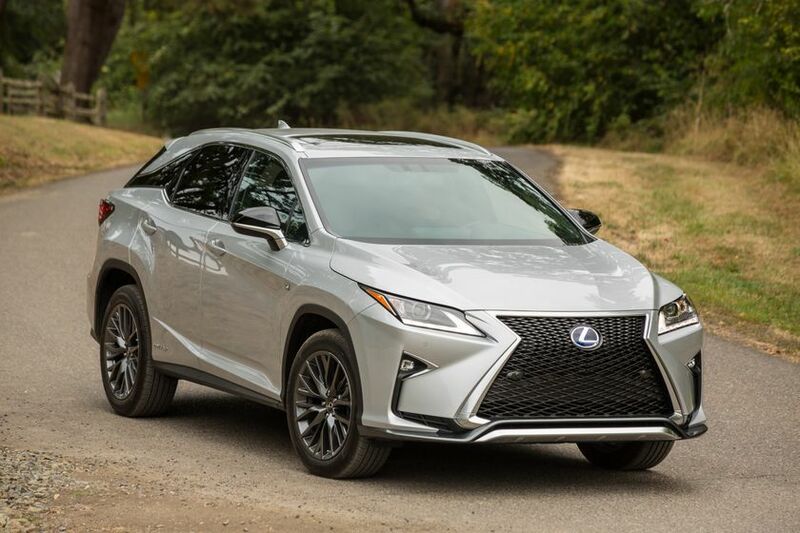 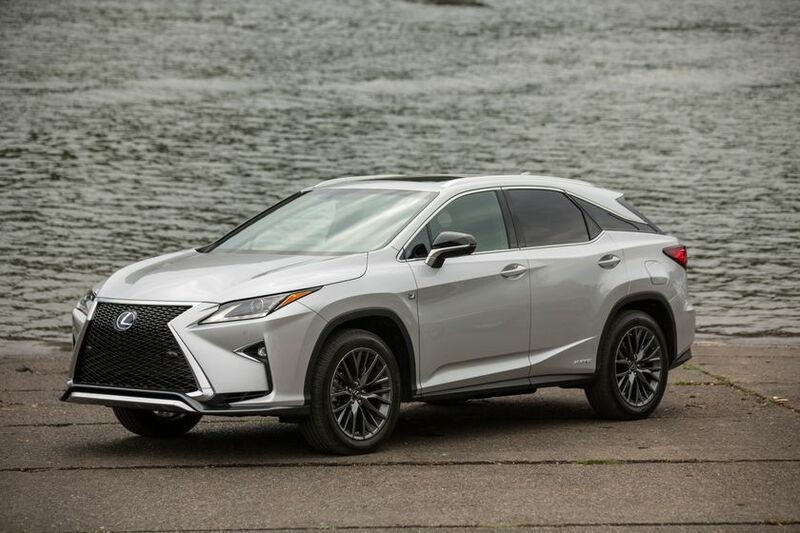 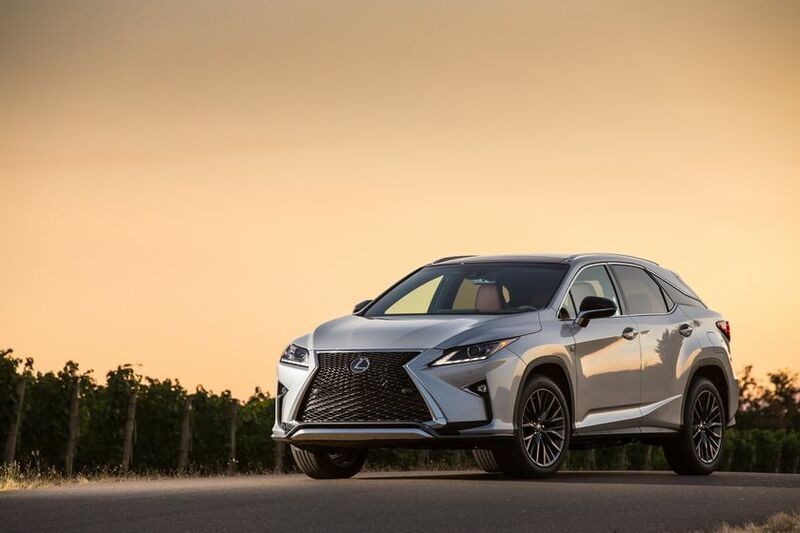 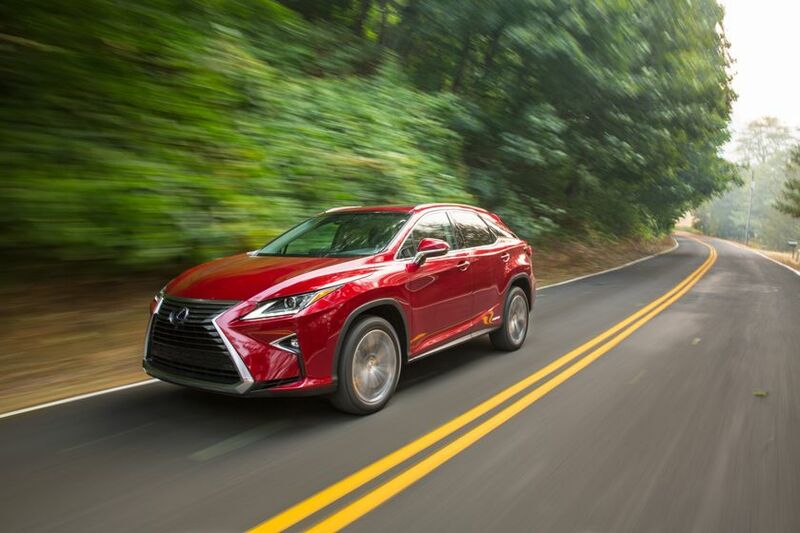 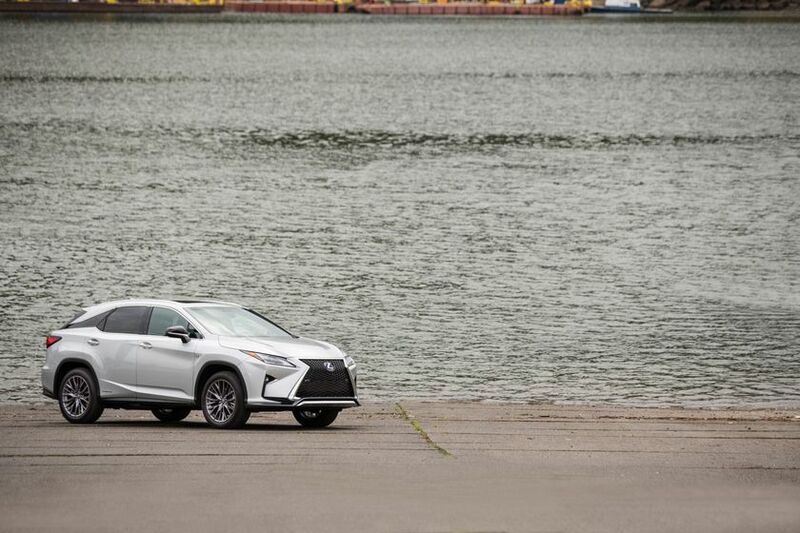 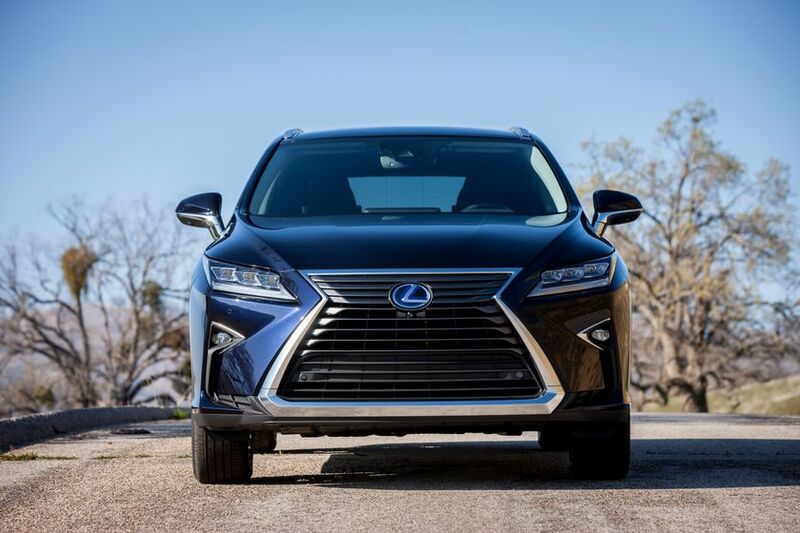 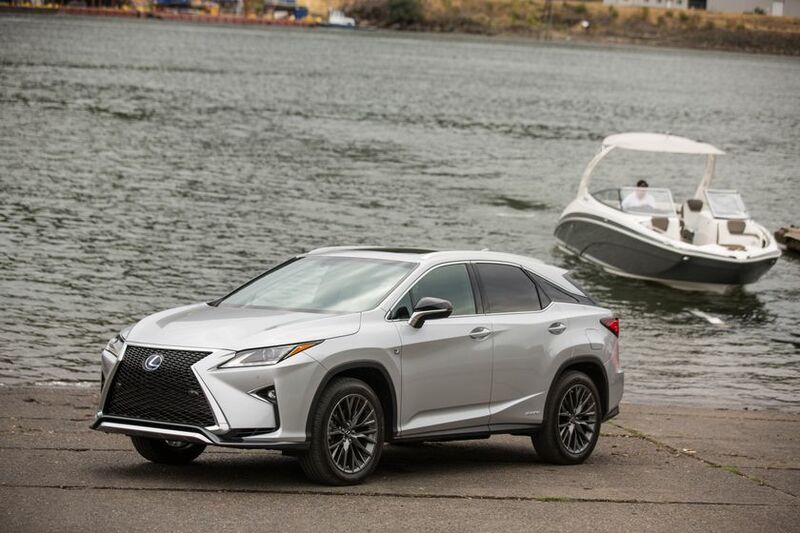 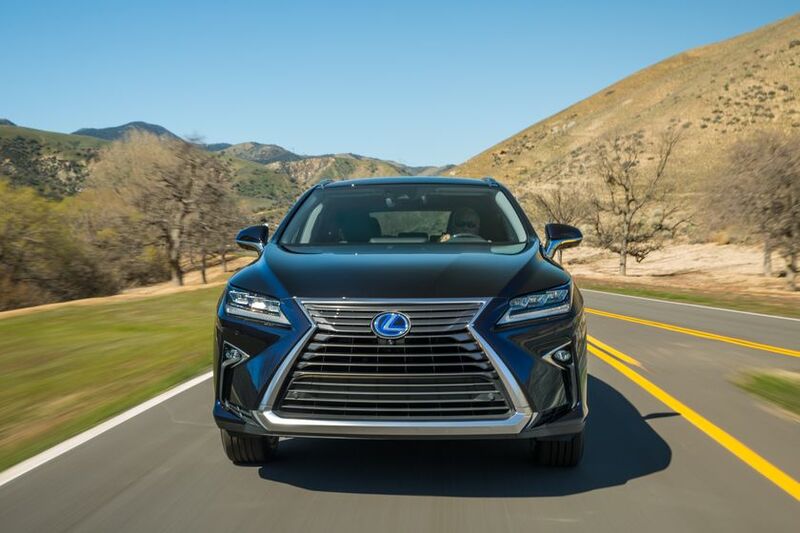 The RX 350 F SPORT builds on this while drawing upon Lexus’ racing heritage, mating the 3.5L V6 to an eight-speed automatic transmission with paddle shifters and specially tuned handling systems to deliver a more dynamic driving experience. 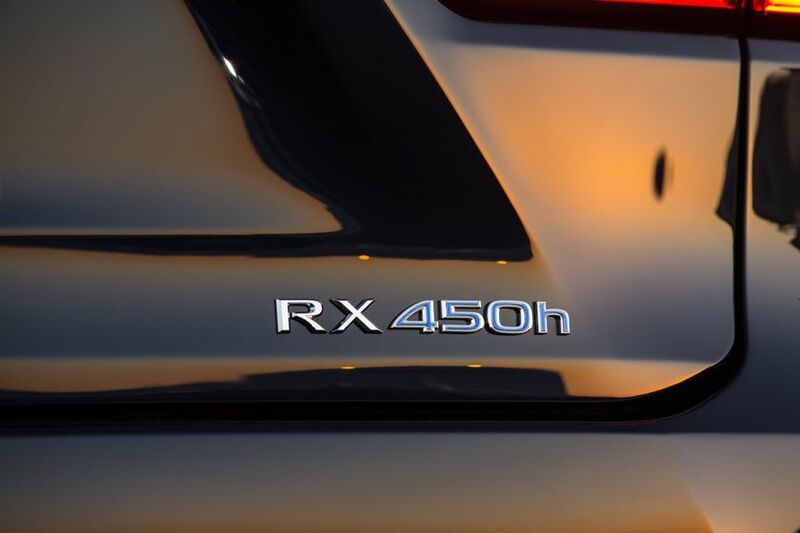 The RX 450h is built around the advanced and efficient power of the Lexus Hybrid Drive and – for the first time – is offered in an available F SPORT configuration. 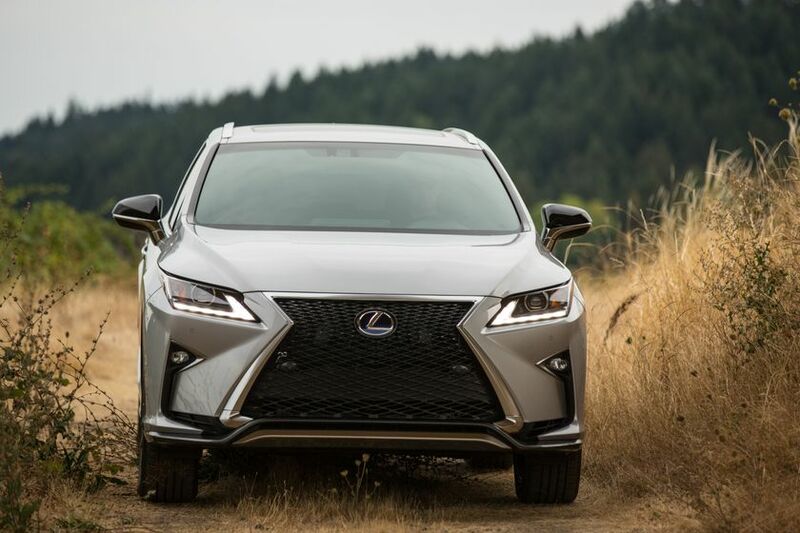 The front view of the 2016 Lexus RX is characterized by an emboldened version of the Lexus brand’s signature spindle grille, featuring a chrome-plated border and triple L-shape-LED headlamps. 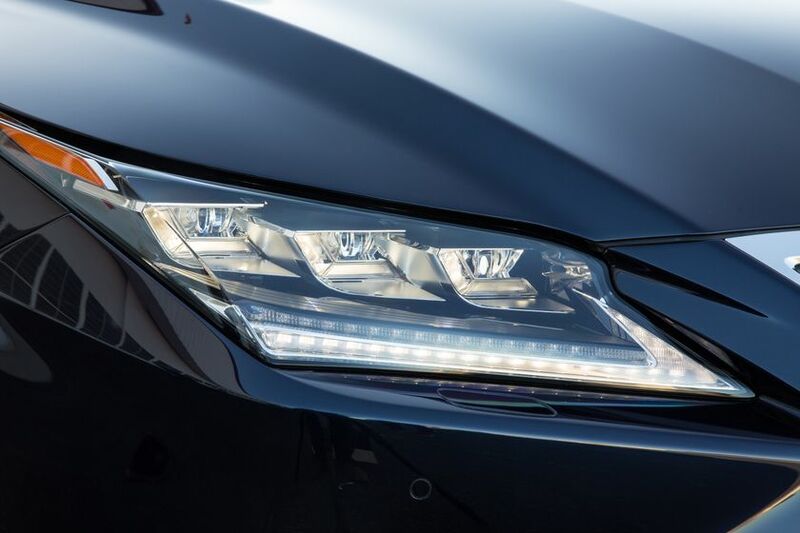 Depending upon the grade, there are two types of headlights available: a compact Bi-LED headlight or an available L-shaped LED headlight accompanied by 18 individual LEDs. 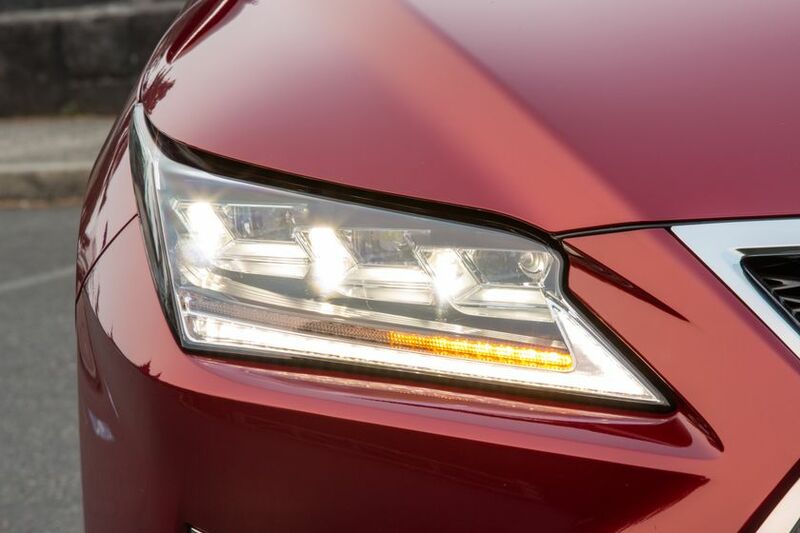 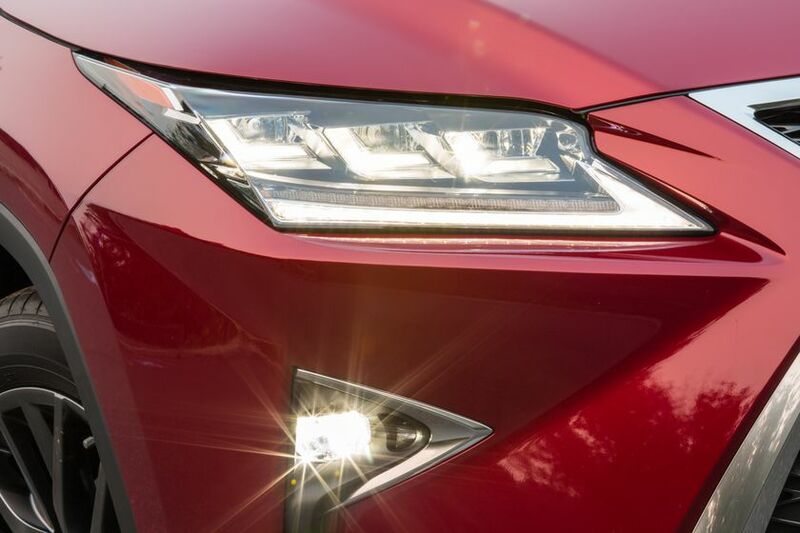 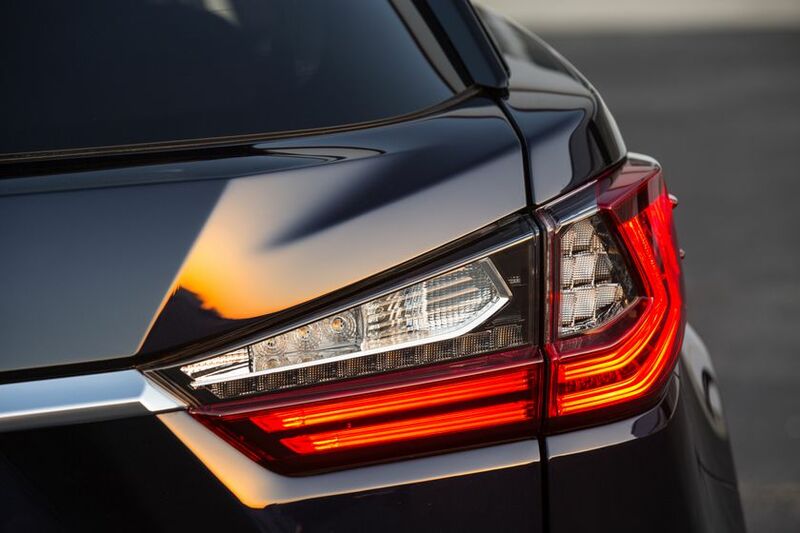 In the L-shaped LED headlight system, the 18 individual LEDs that surround the headlights not only act as turn signal indicators, but also illuminate sequentially from the inside section of the headlamp toward the outside when the driver activates the turn signal—a first for Lexus. 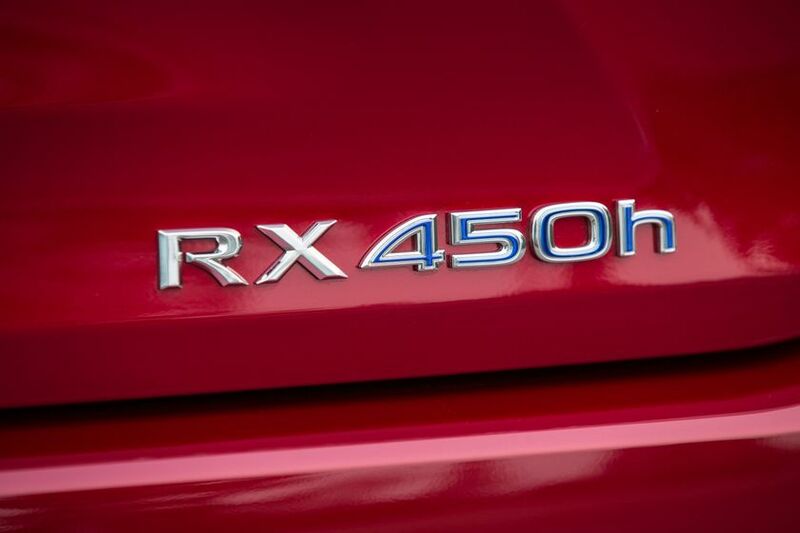 The “spindle” design theme of the front of the RX also defines its rear design, providing a high level of aesthetic balance and consistency to the vehicle’s overall demeanor. 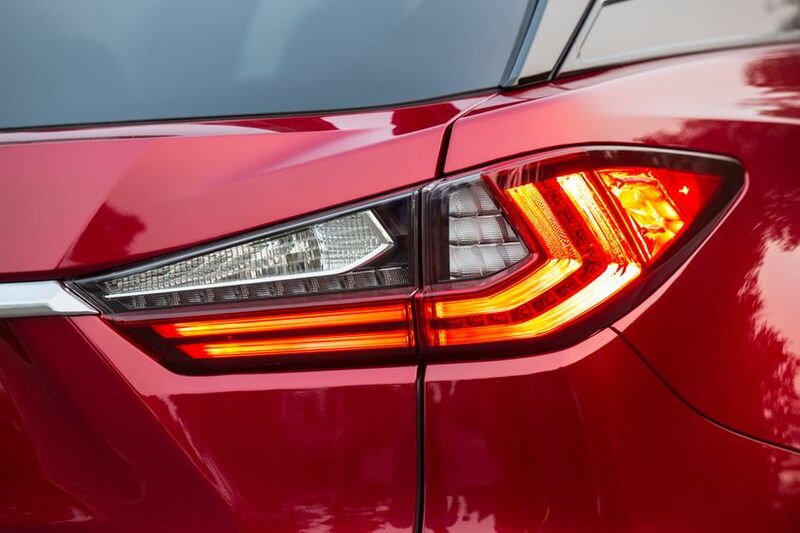 The LED rear combination L-shaped taillights envelop the tailgate while wrapping forward around the rear fender sections, resulting in a powerful and wide stance. 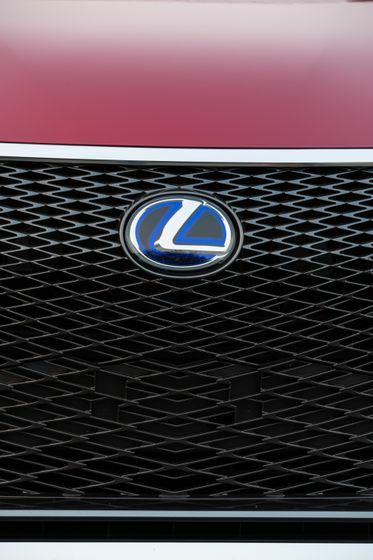 Of particular note are the blacked-out C-pillars, which provide a floating-roof effect never before seen on a Lexus product. 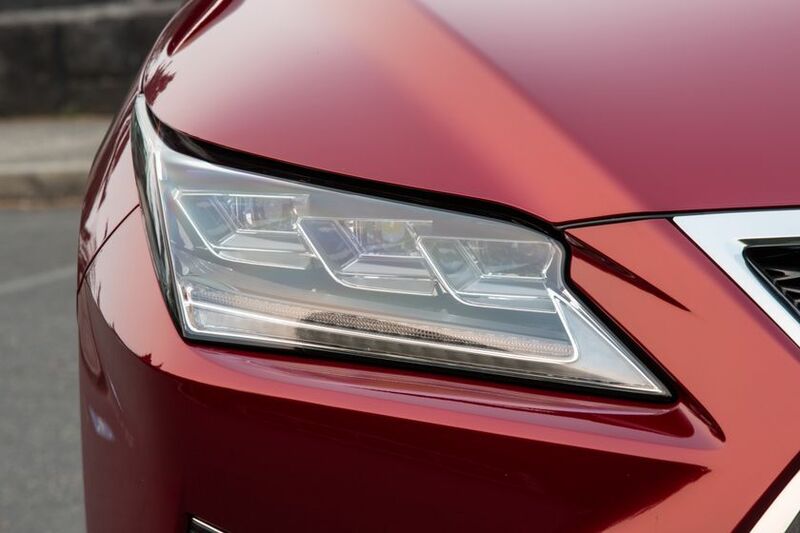 Other new exterior features are flush-fitting headlight washers, panoramic moon roof design, solid roof rails, redesigned Smart Entry System door handles and convenient door handle illumination. 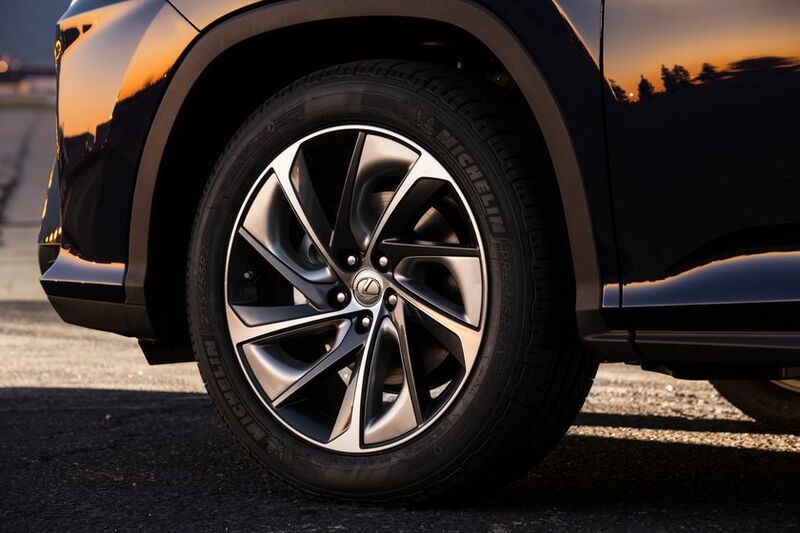 A choice of stylish aluminum wheel designs include 18-inch and massive 20-inch designs that convey a sporty, energized look to the new RX. 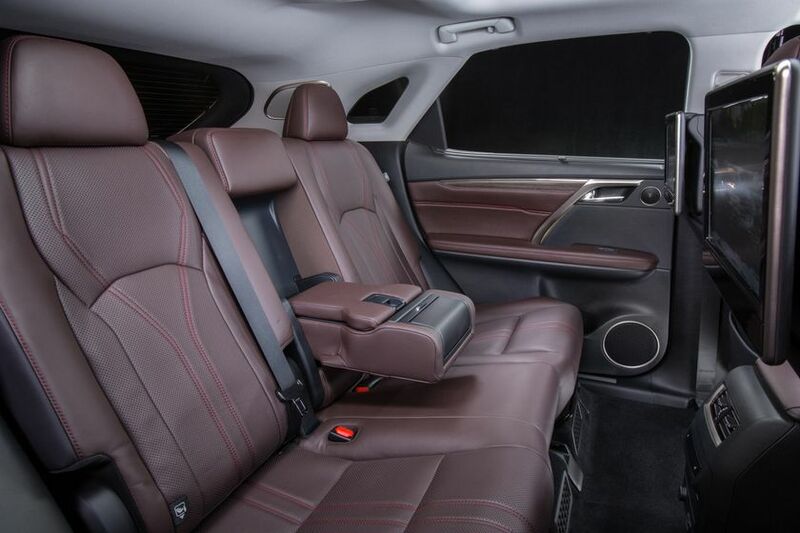 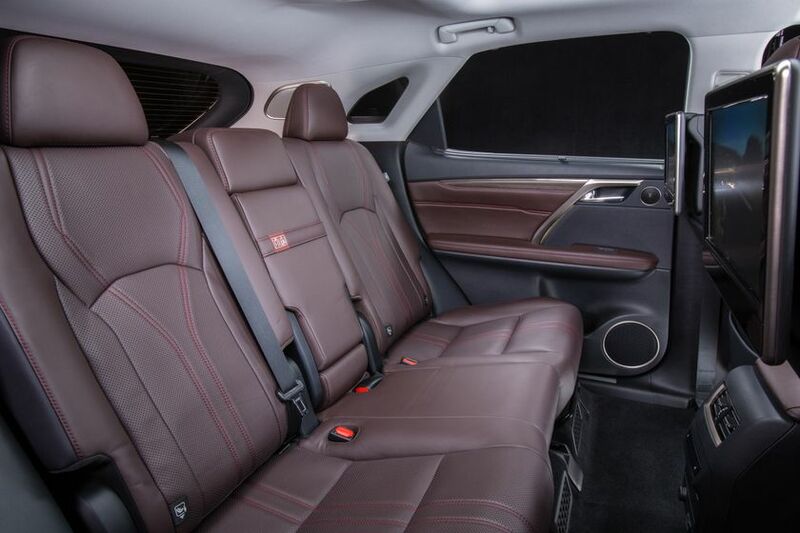 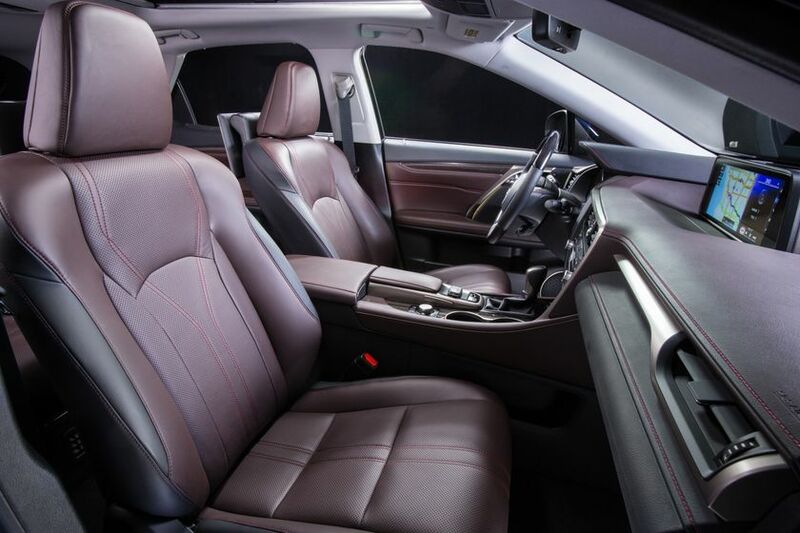 The interior of the new RX reflects an impeccable balance of functionality and opulence. 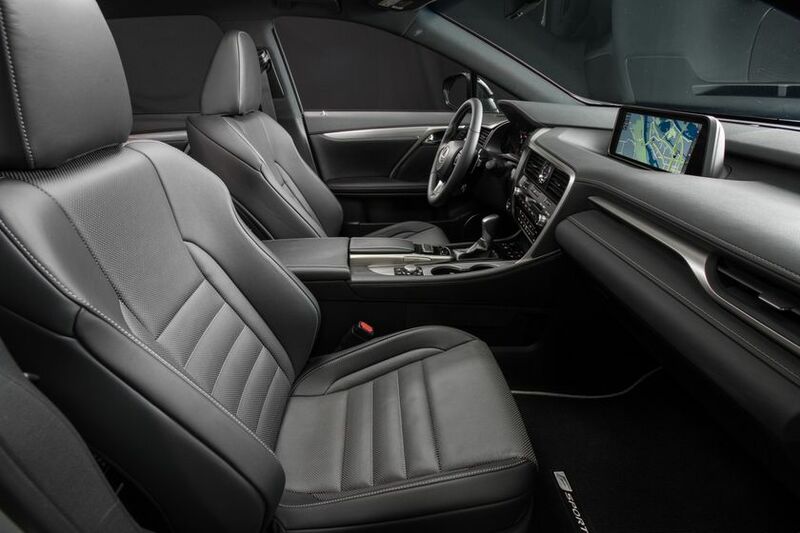 Like virtually everything else on this exceptionally well-crafted and thoughtful redesign of the RX, there have been a number of enhancements to the interior trim. 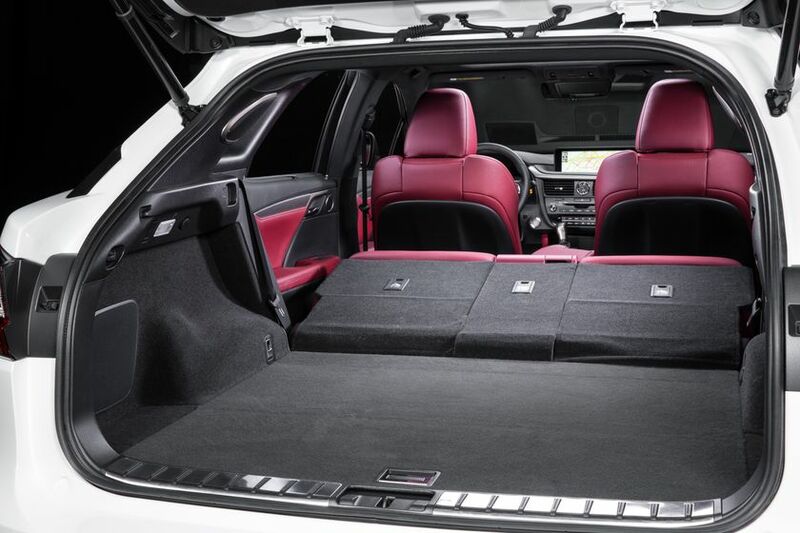 With an interior space optimized for five passengers, the new RX’s lowered rear floor section helps provide a seating position comparable to that of the rear-seat passengers in the flagship Lexus LS luxury sedan. 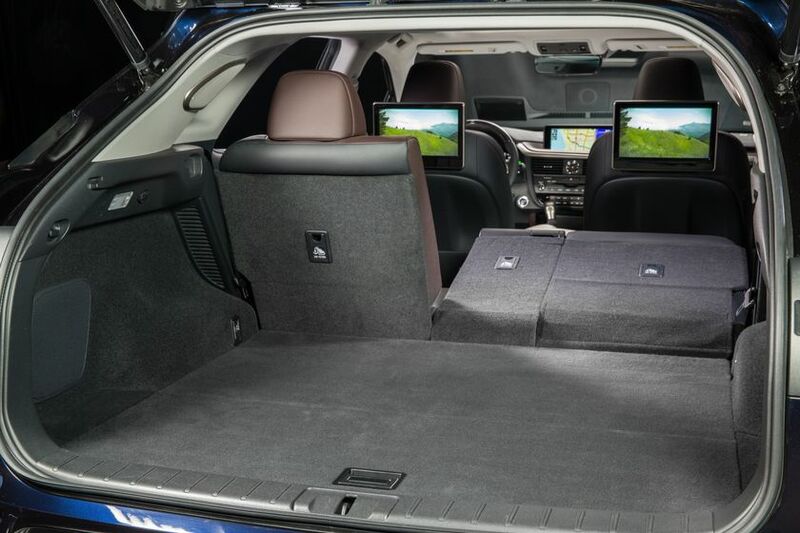 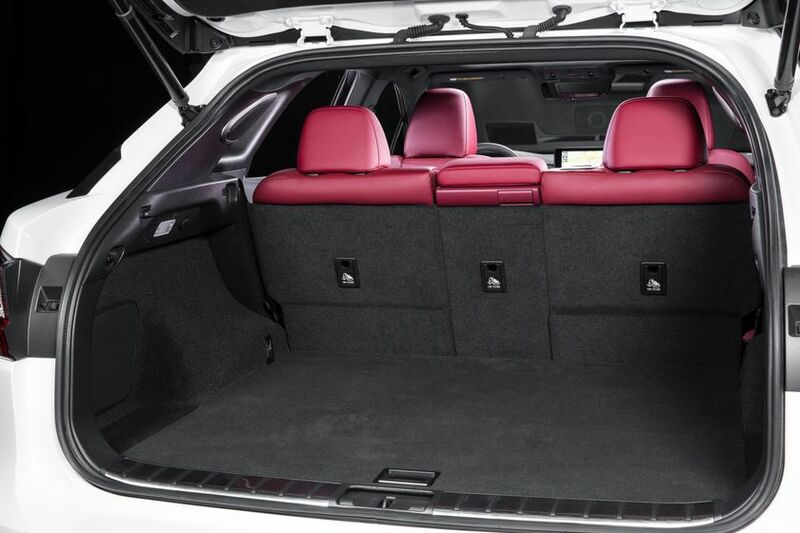 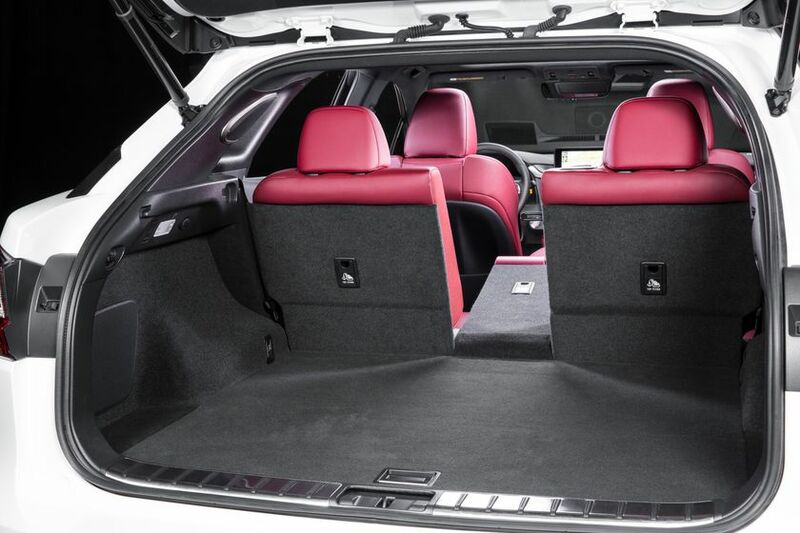 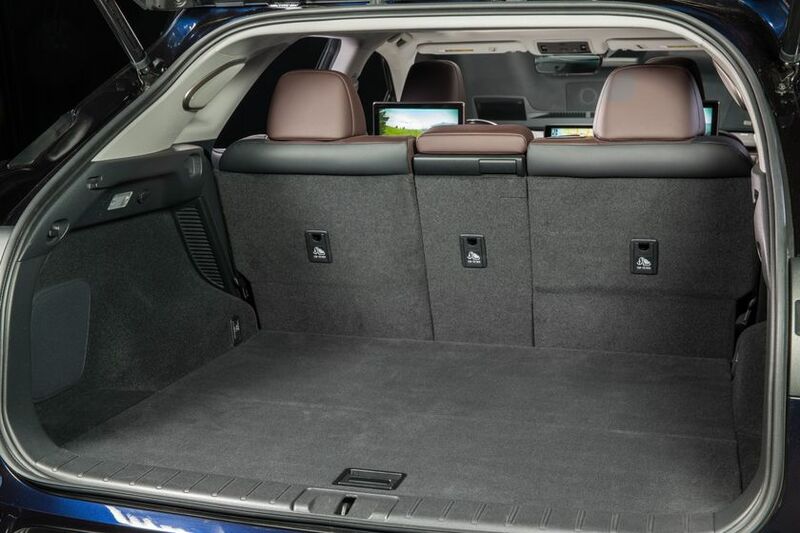 The new RX features ample rear cargo space – larger than in competing crossovers within the segment – with room enough to fit large items, including up to four large suitcases or multiple golf bags. 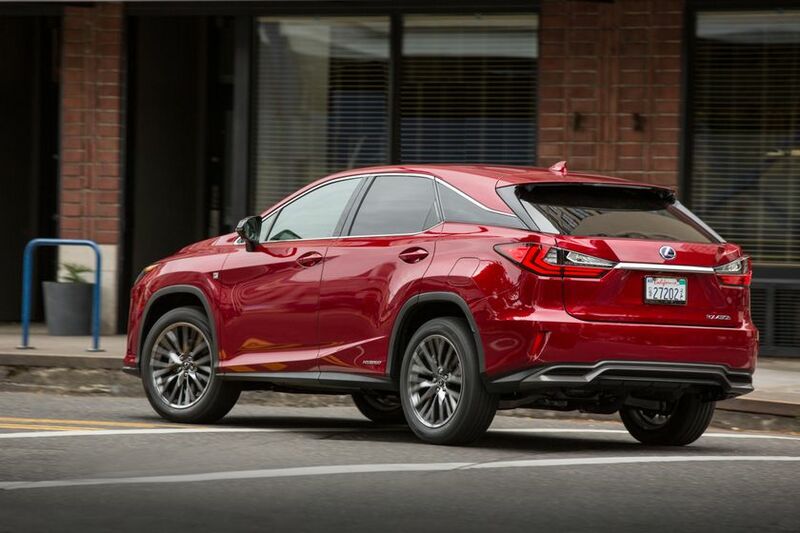 New for this model year is the available touchless power back door – a Lexus first – which allows users to open the rear hatch by placing a hand near the Lexus emblem. 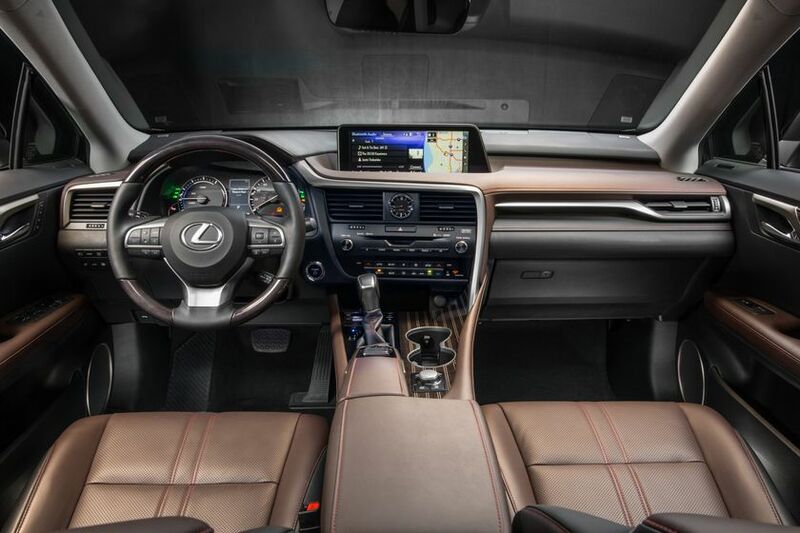 Lexus designers and engineers gave a great deal of consideration to the layout of the redesigned center console of the RX, resulting in improvements in the usability of controls and the accessibility of cup holders and storage areas. 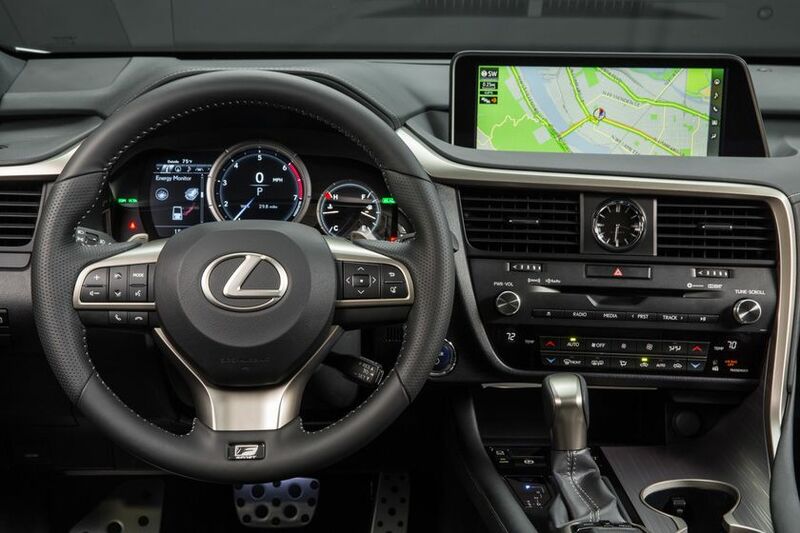 Based upon the concept of the Lexus Human Machine Interface (HMI) that allows the driver to concentrate on the road ahead with minimal distraction, a feature incorporated into the design of the new-look instrument panel is a Head-Up Display (HUD) system. 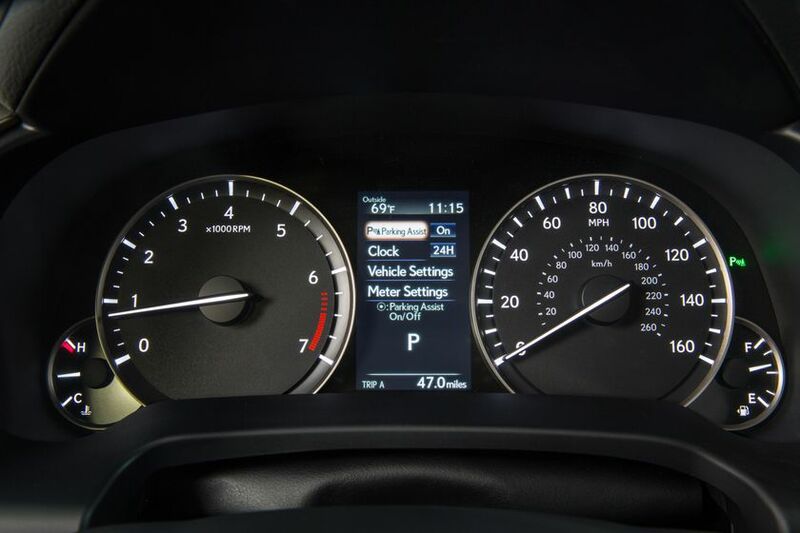 The redesigned instrument cluster offers the driver instantaneous information with a quick glance from its large and easy-to-read gauge faces. 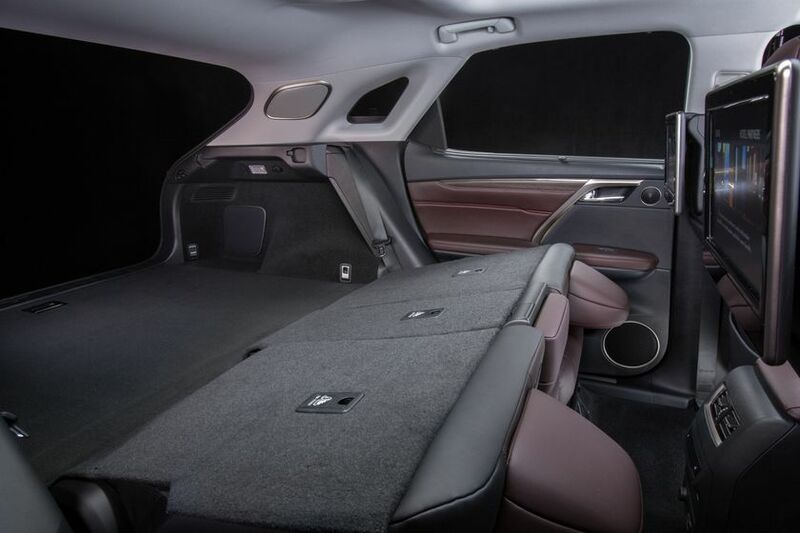 The standard audio system is a 12-speaker Lexus Premium audio system, featuring a subwoofer with Coherent Source Transducer technology and newly-developed woofers in the front doors. 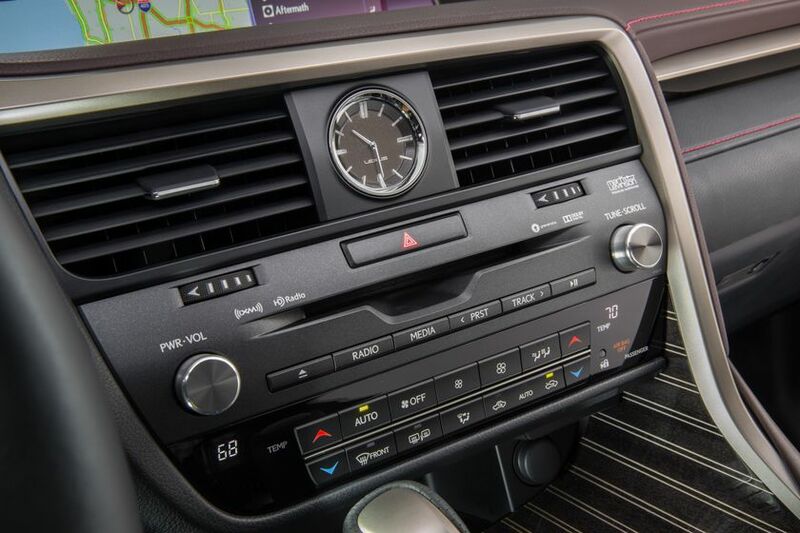 Other features include Bluetooth® capability, USB inputs, Auto Sound Levelizer technology, Integrated XM Satellite Radio, steering wheel-mounted audio controls and a roof-mounted fin antenna. 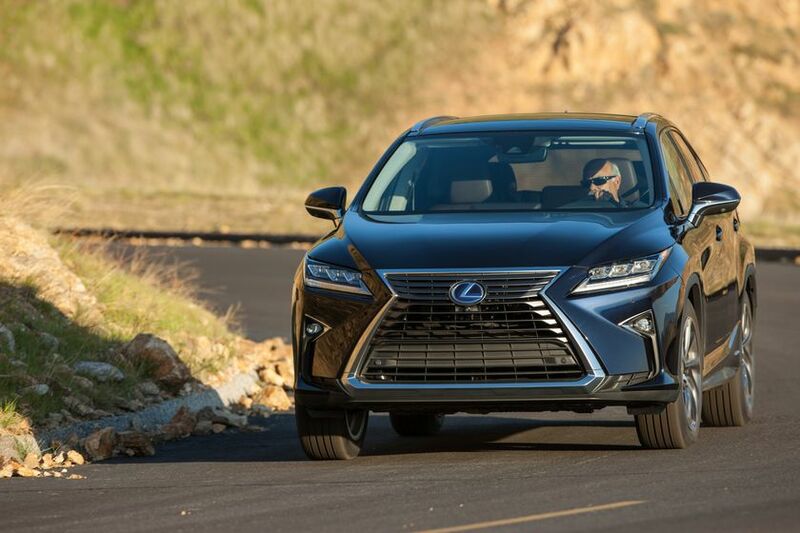 The 2016 RX 350 is standard equipped with an 8-inch high-definition Thin Film Transistor liquid crystal display, featuring a high level of contrasting clarity as well as minimal color variation when viewed at different angles from either the driver or the front passenger seat. 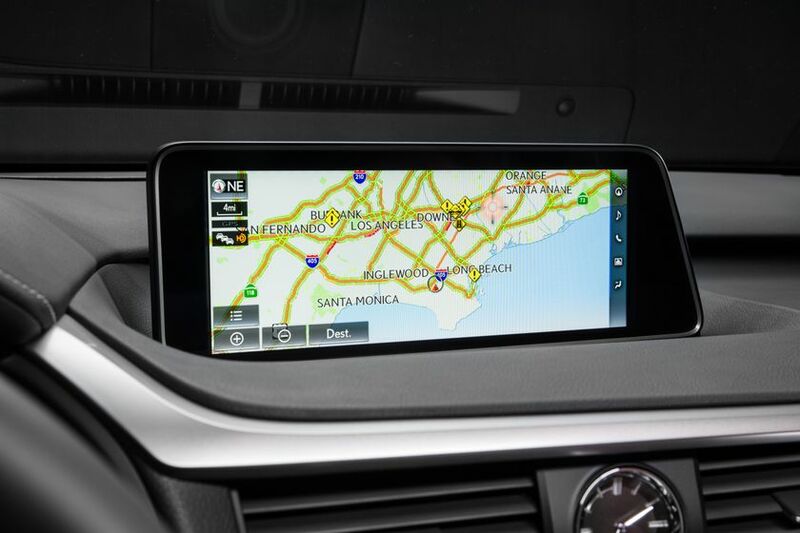 A premium navigation system is available on the RX 350 and standard on the RX 450h. 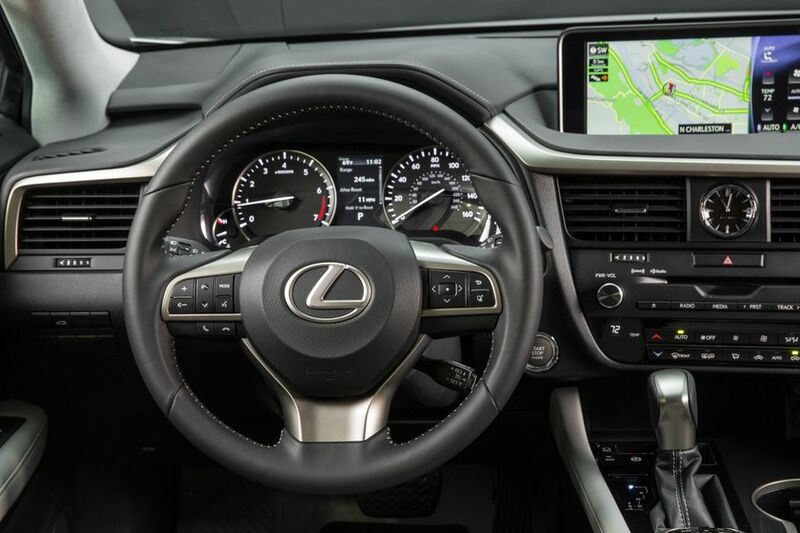 This features a 12.3-inch Electro Multi Vision display features a large high-definition Thin Film Transistor liquid crystal display, improved Lexus Multimedia with new-look graphics and the newest generation of the Lexus Remote Touch interface. 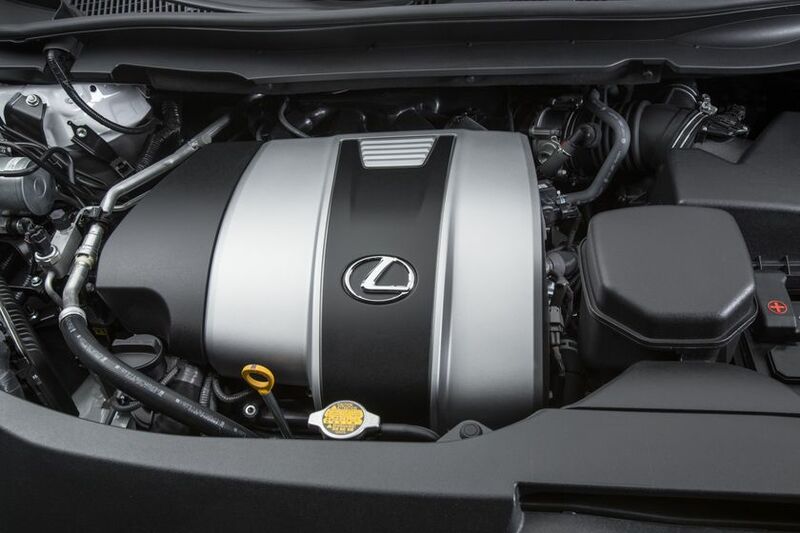 The 3.5L direct-injected gasoline-powered V6 engine in the RX 350 and RX 350 F SPORT offers class-leading levels of performance, fuel efficiency and reduced emissions while delivering prodigious power when summoned by the driver, with smooth and highly-refined operating characteristics in normal everyday operation. 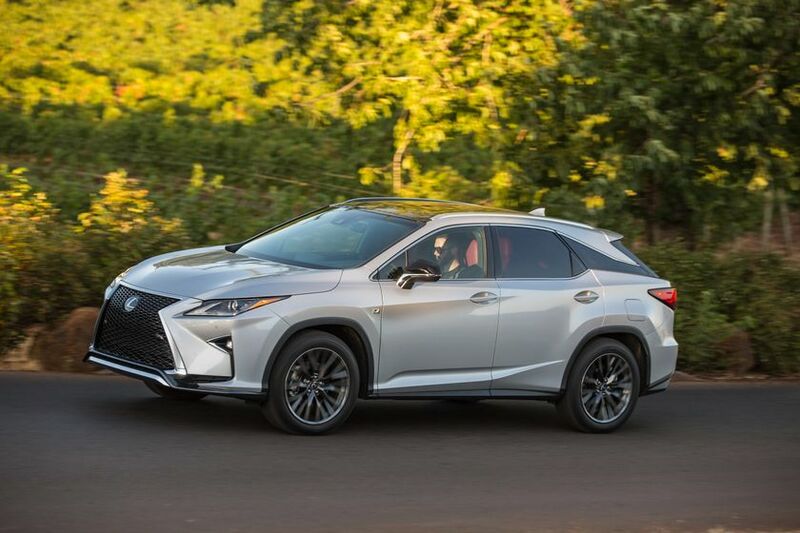 To enhance breathing and fuel efficiency, Lexus engineers specified an all-new cylinder head design with reshaped intake ports and combustion chambers for added efficiency in the engine’s combustion process, D-4S fuel injection system that enables direct injection to the cylinders with high fuel pressure. 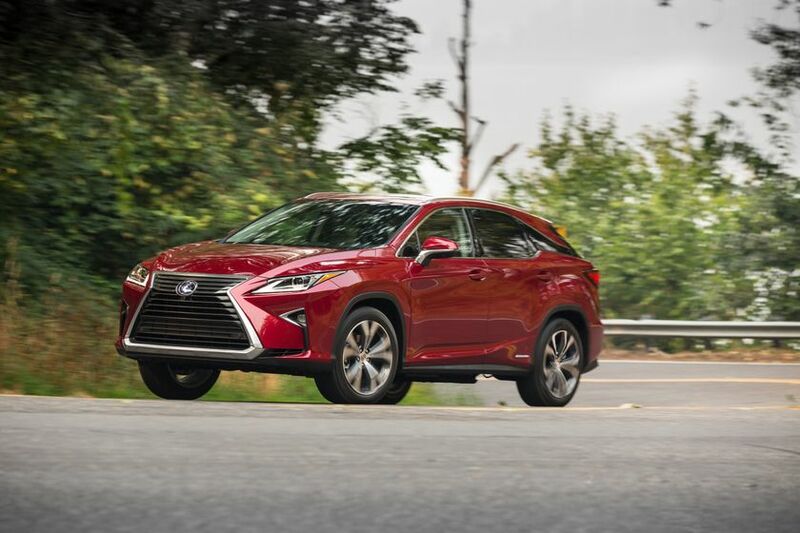 To maximize torque throughout the engine’s operating range, Variable Valve Timing with intelligence Wide (VVT-iW) has been included on the intake side, while the exhaust side features VVT-i. 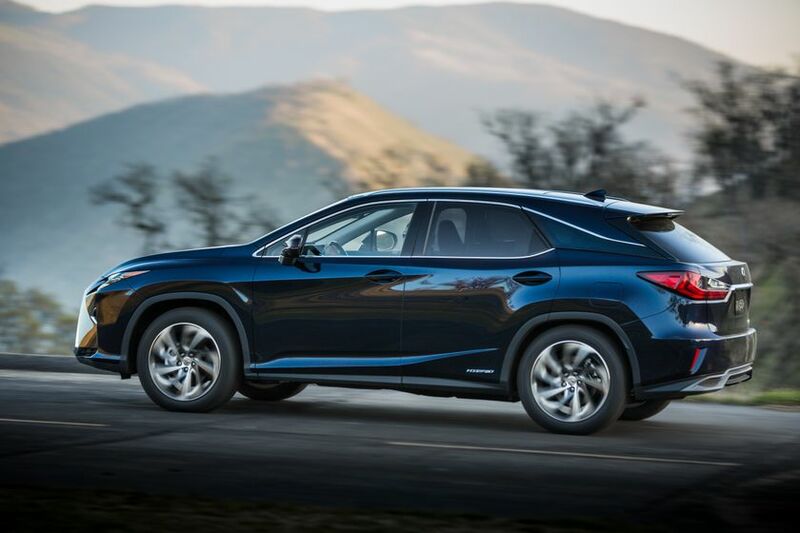 The inclusion of VVT-iW has enabled the adoption of the Atkinson cycle to further benefit fuel economy, without sacrificing engine start-up in extremely cold conditions and during Wide Open Throttle (WOT) driving. 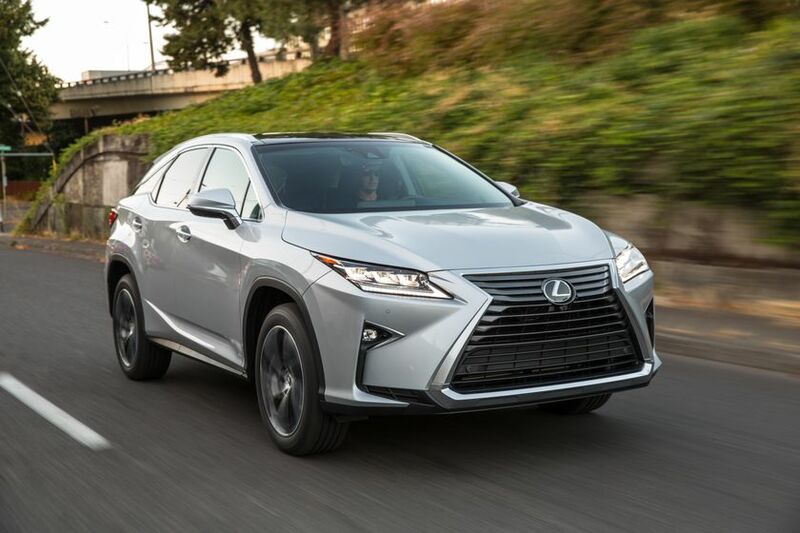 A paragon of efficiency with plentiful power when needed, the completely reengineered 3.5L direct-injected V6 hybrid engine used in the RX 450h is an evolution of the base six-cylinder drivetrain, featuring newly-shaped intake ports and combustion chambers that generate a high degree of tumble inside the cylinders to improve combustion. 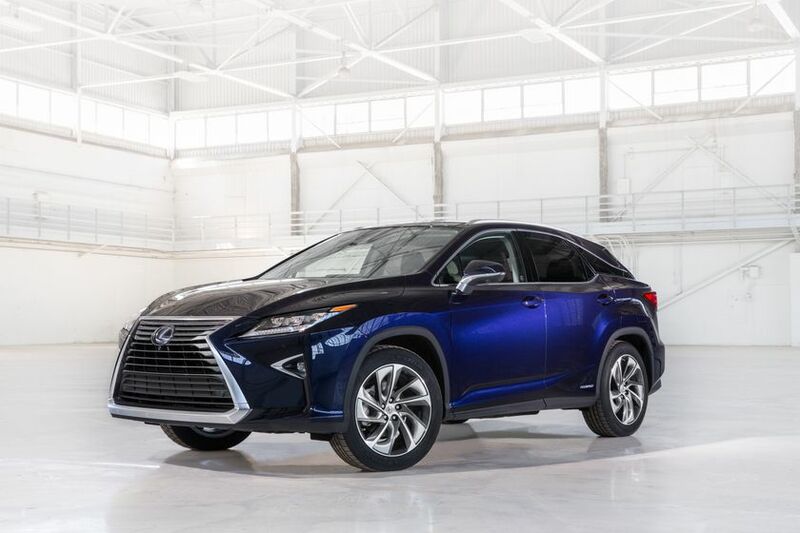 In a Lexus-first for a hybrid vehicle, the all-new RX 450h is available with an optimally-tuned sound generator system that creates a powerful and distinctive performance-oriented intake sound by using air intake pulsations to raise the sound pressure level with three distinct resonance frequencies. 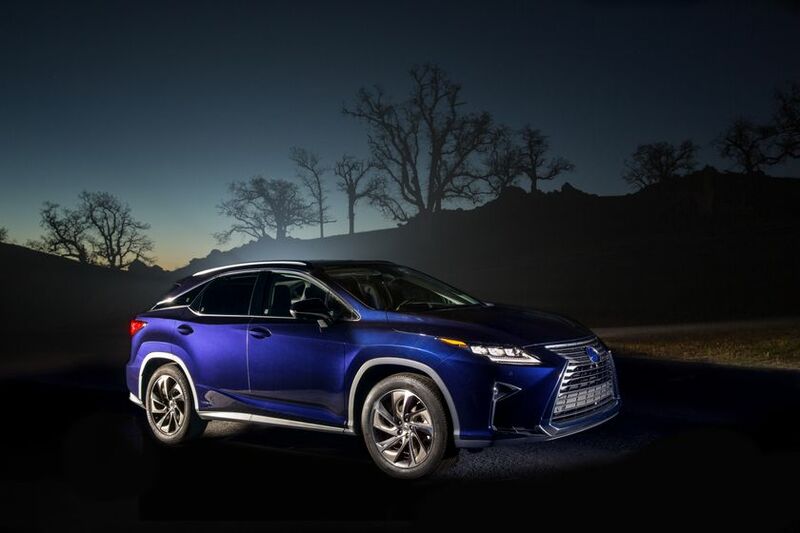 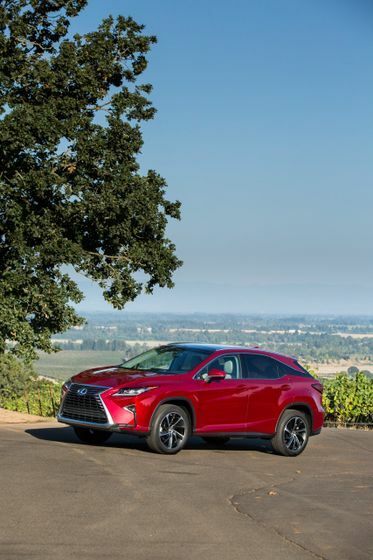 The hybrid-powered drivetrain in the all-new Lexus RX is the latest, most advanced iteration of the Lexus Hybrid Drive system. 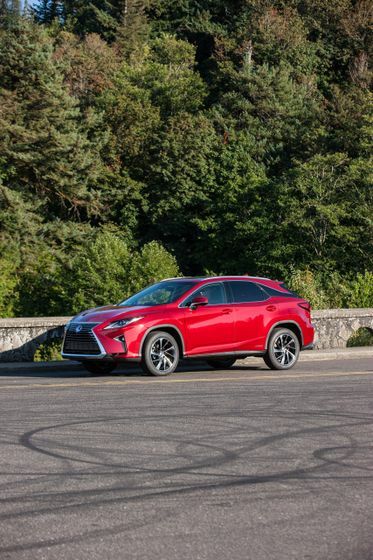 Its key components and control systems have been improved and engineered to deliver class-leading fuel economy, minimal emissions and excellent on-road performance that’ll satisfy the most demanding driving enthusiast. 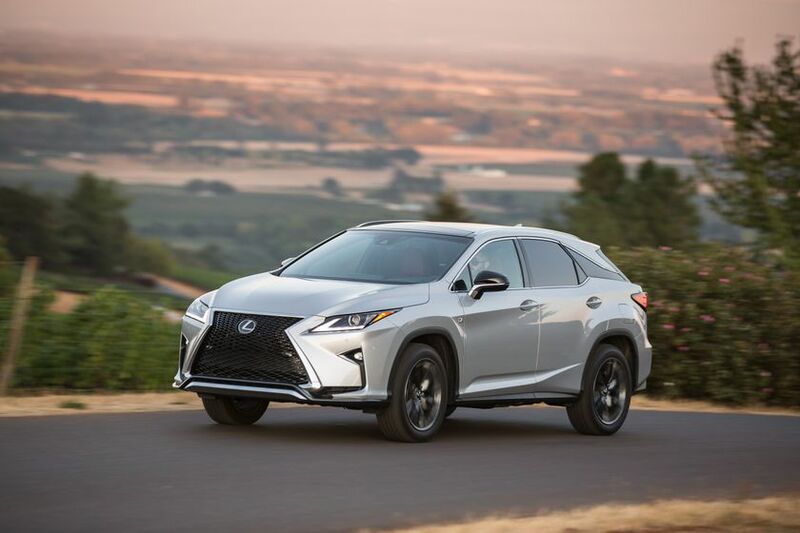 The transmission includes a hybrid front transaxle with new features including a water-to-oil cooler for improved motor/generator cooling performance at low speeds and a pre-loaded differential. 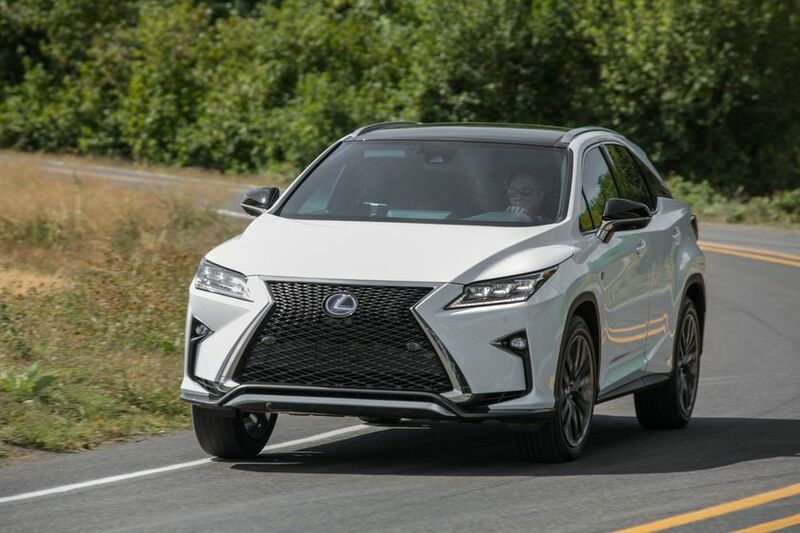 The rear transaxle combines an electric motor with a reduction drive, features a new three-shaft configuration and aluminum case and cover to reduce weight. 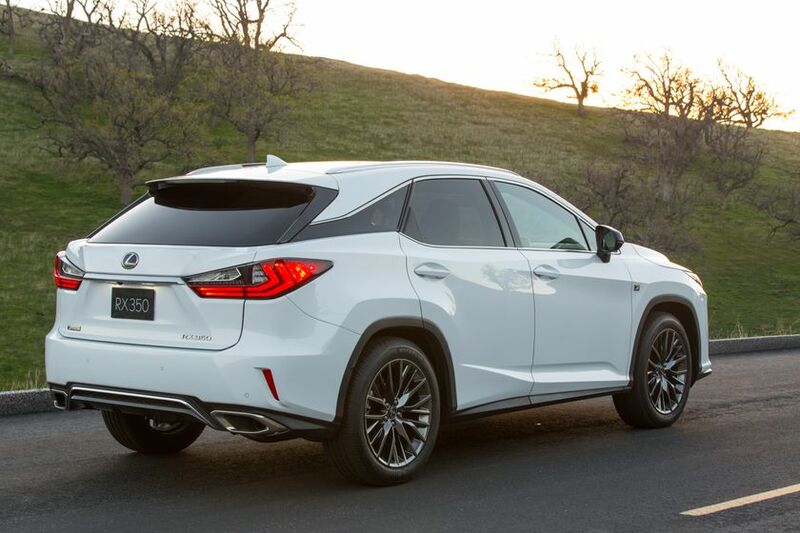 These upgrades help this new Lexus Hybrid Drive system achieve class-leading driving performance, quietness and fuel efficiency. 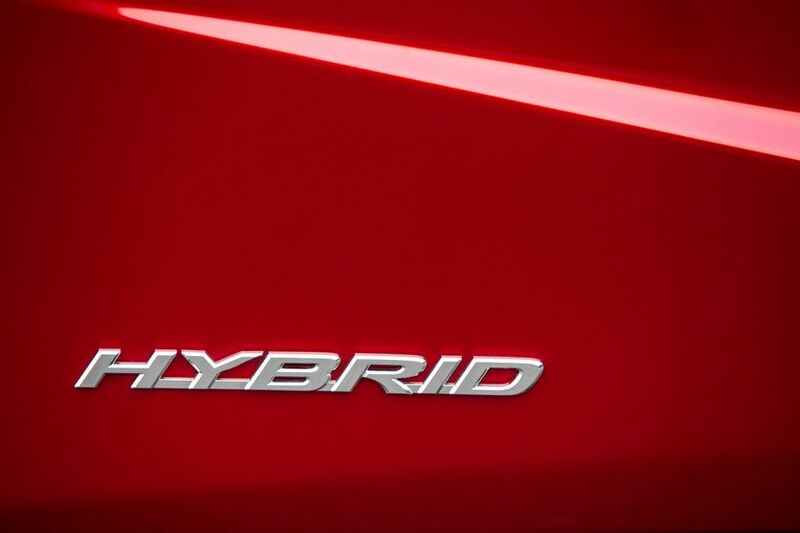 Other updates to the system include: An evolution of the power management system to deliver better energy efficiency, more driver-friendly operation and more refined performance; implementation of a lighter, more efficient hybrid system coolant electric water pump; the addition of a new water-to-oil cooler to the transaxle for improved driving performance; and packaging changes to the hybrid battery that result in a more compact design for improved space efficiency. 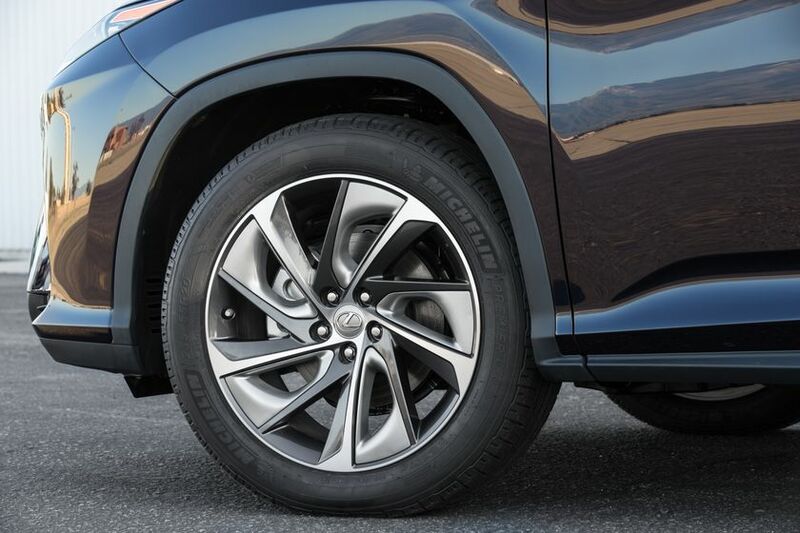 Also, engineers improved the control functions of the electric motor on the rear axle for better response when accelerating during turns. 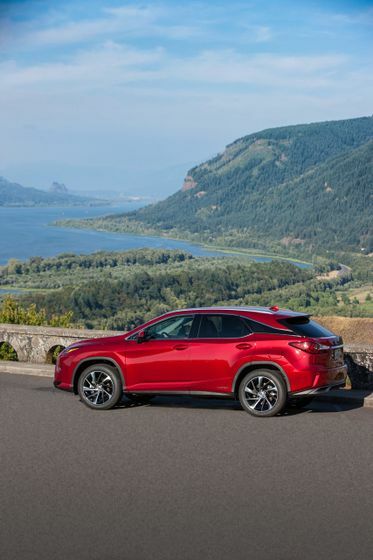 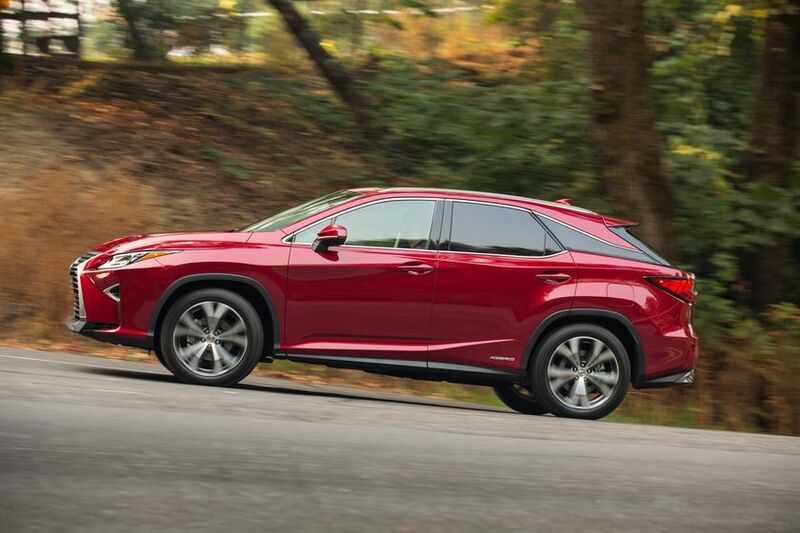 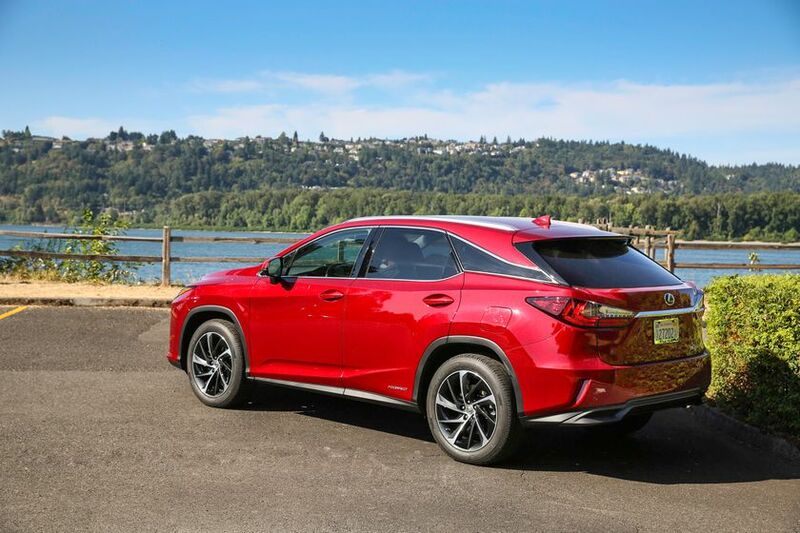 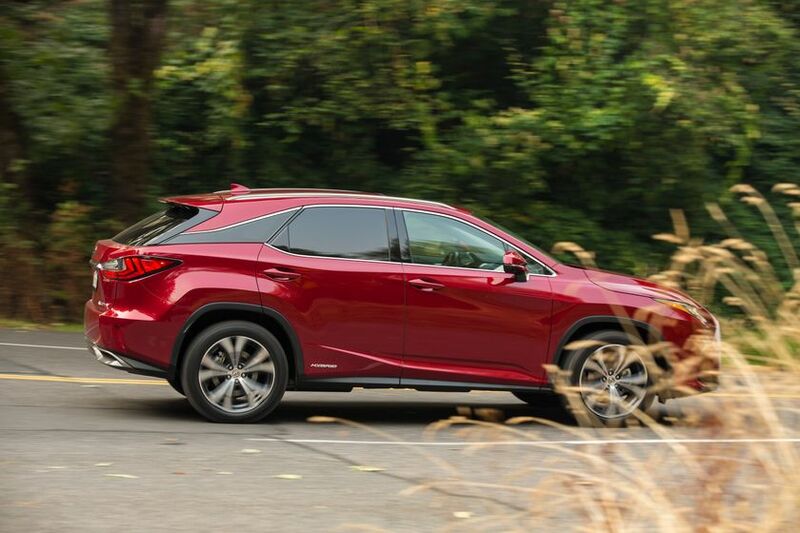 The Lexus RX uses Dynamic Torque Control AWD, which processes information from a number of sensors, including wheel-speed sensors and steering angle sensors. 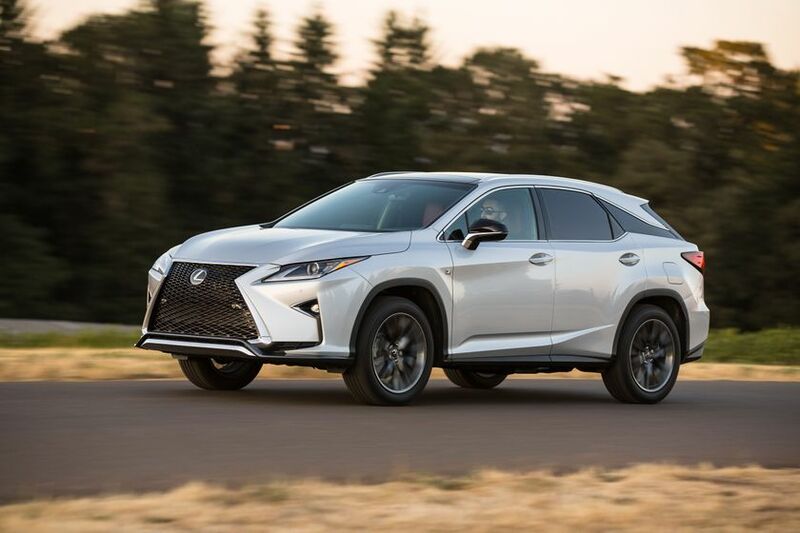 Based on this data, it instantaneously routes engine power to the rear wheels to maximize tractability on varying surfaces and road conditions. 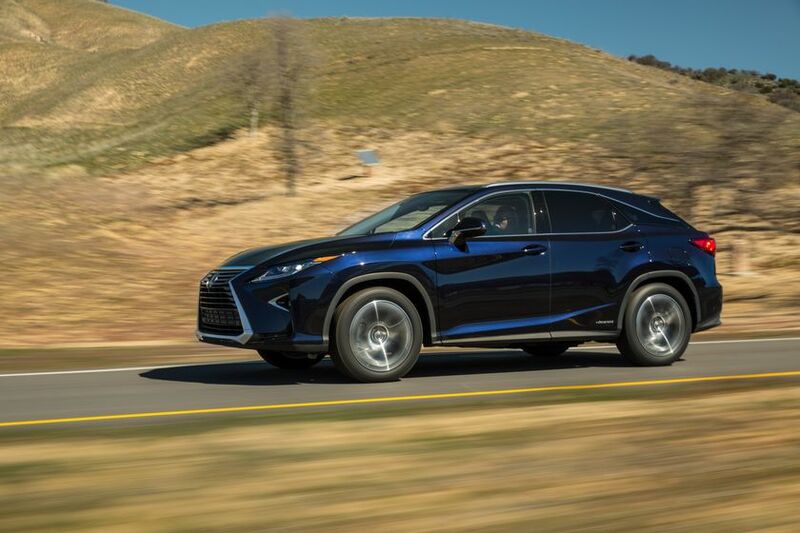 The sophisticated Lexus proactive AWD system used in the RX 450h allows for reduced energy consumption and increased fuel efficiencty by employing the vehicle’s all-wheel drive capability only when necessary. 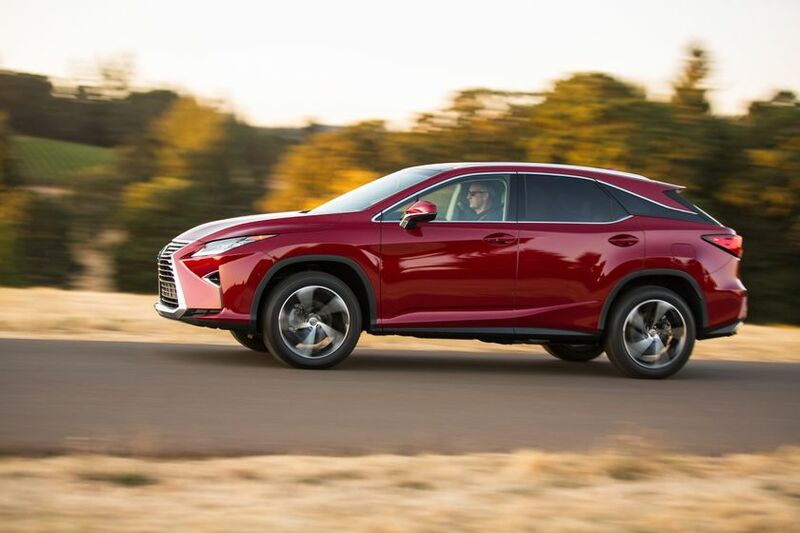 It also allows the rear electric motor to act as a generator to charge the battery when the vehicle is in regenerative brake mode. 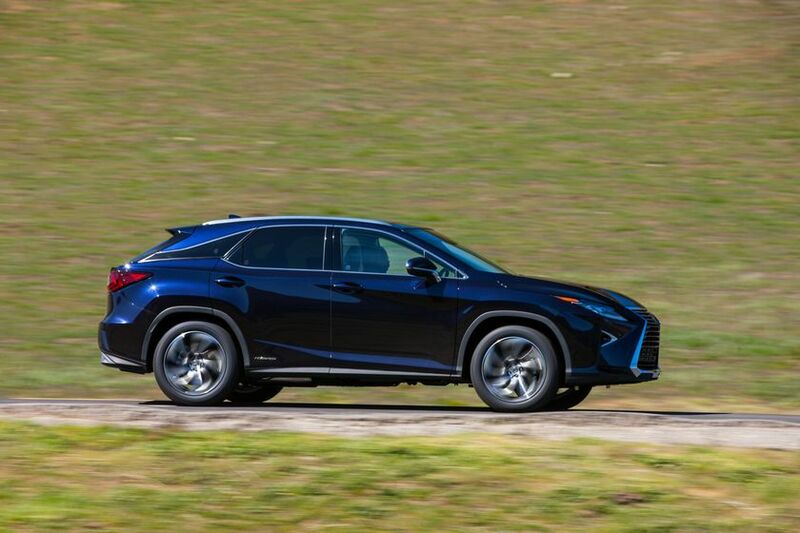 An added feature on the new RX is that the torque distribution levels at the front and rear of the vehicle, as well as to each individual wheel, are displayed on the Multi-Information Display – a Lexus first for both the RX 350 and RX 450h. 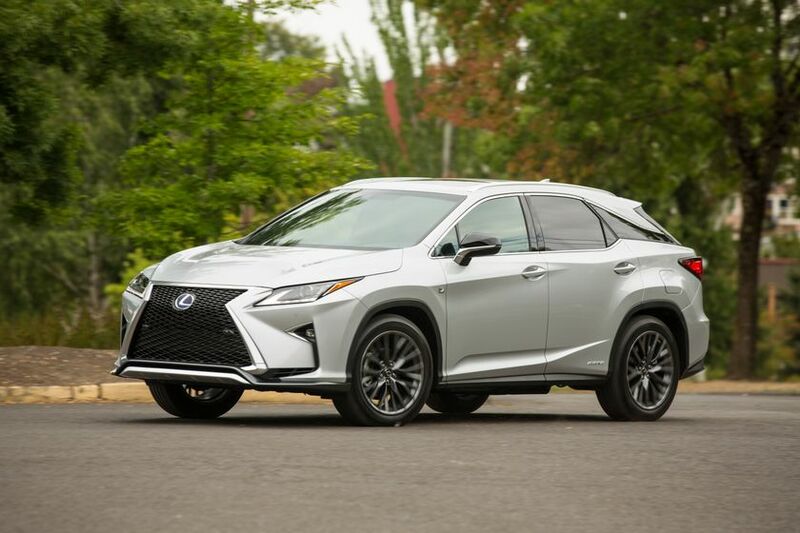 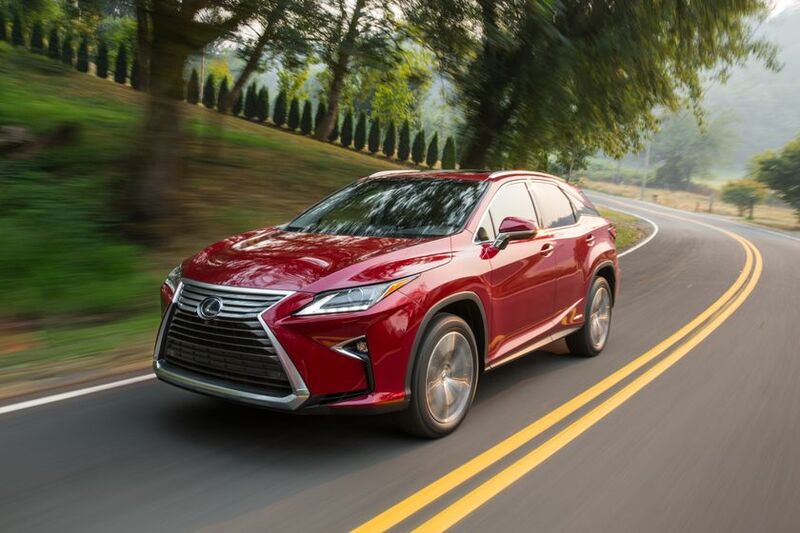 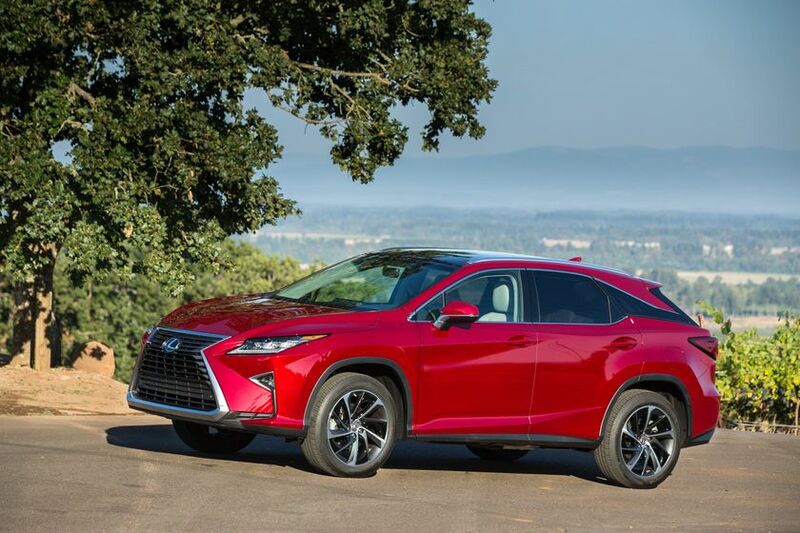 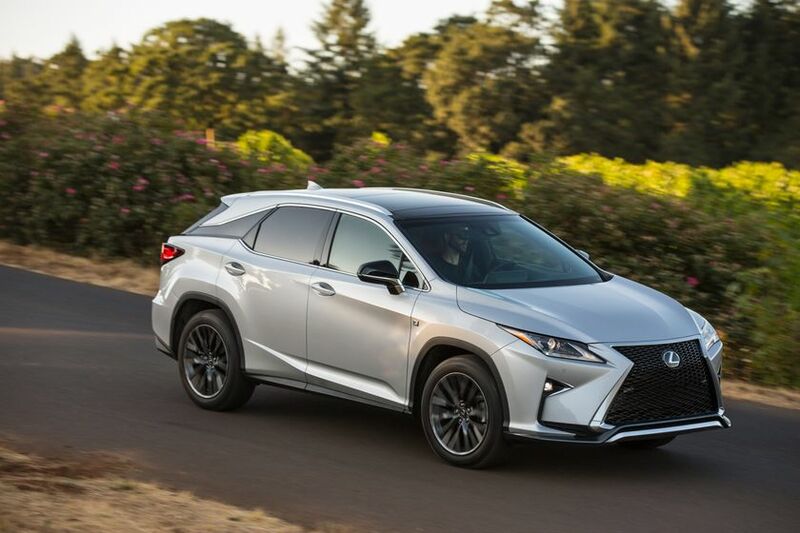 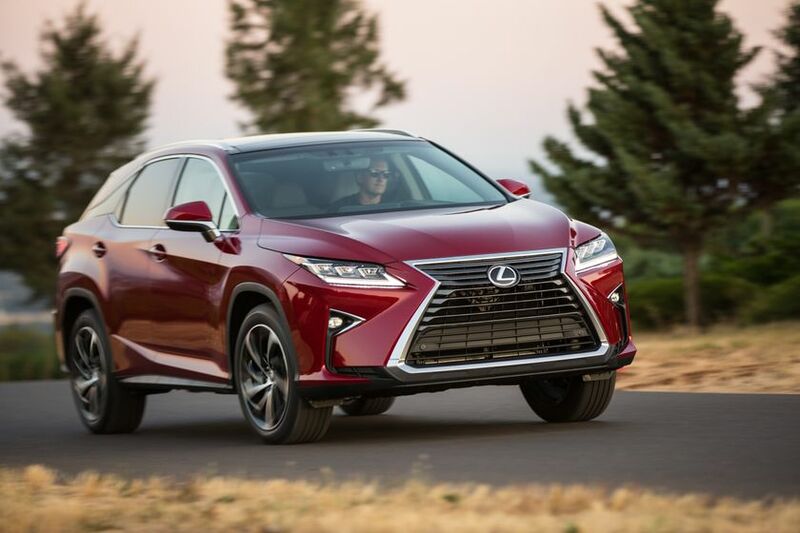 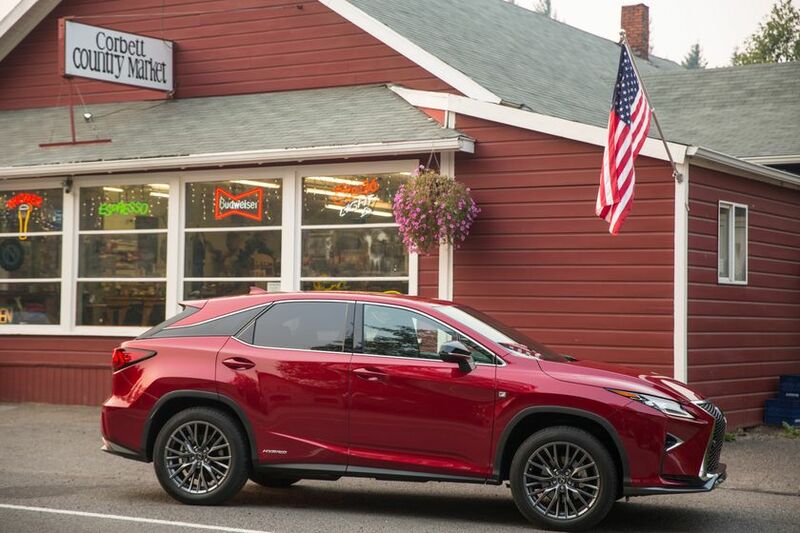 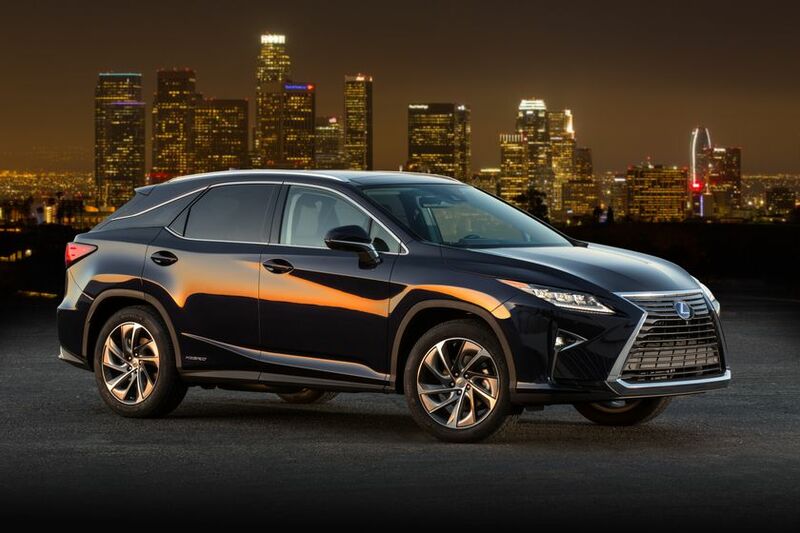 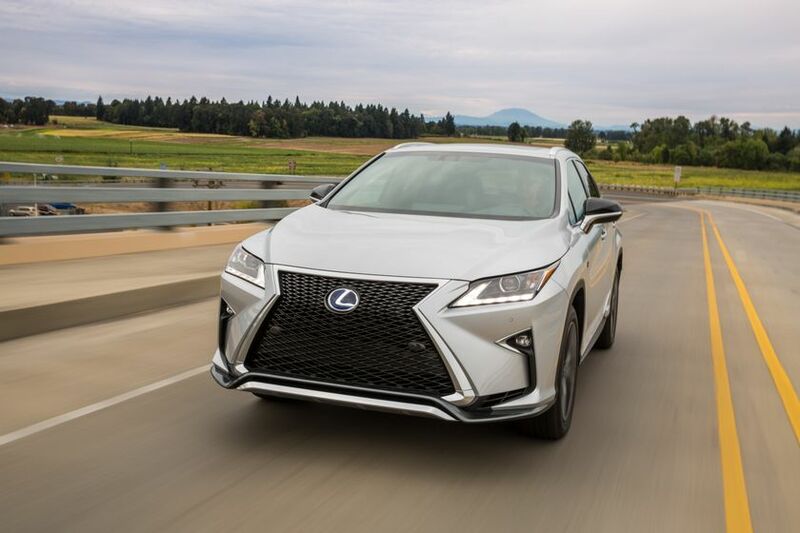 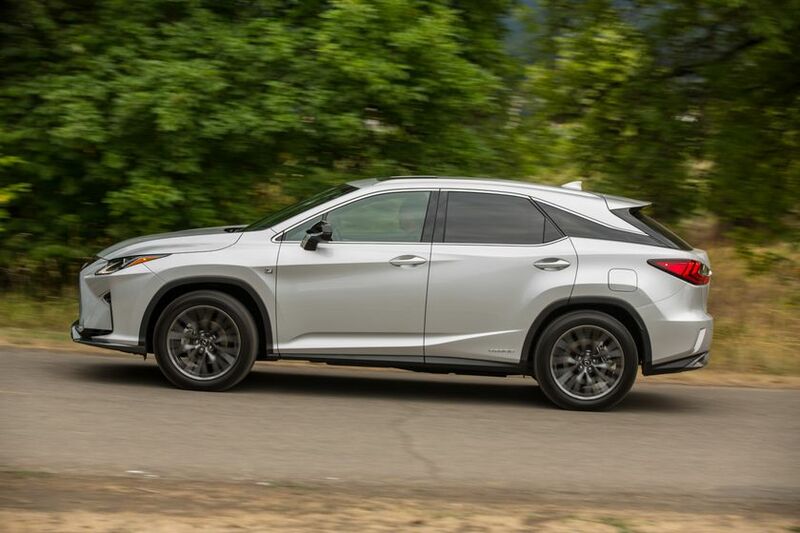 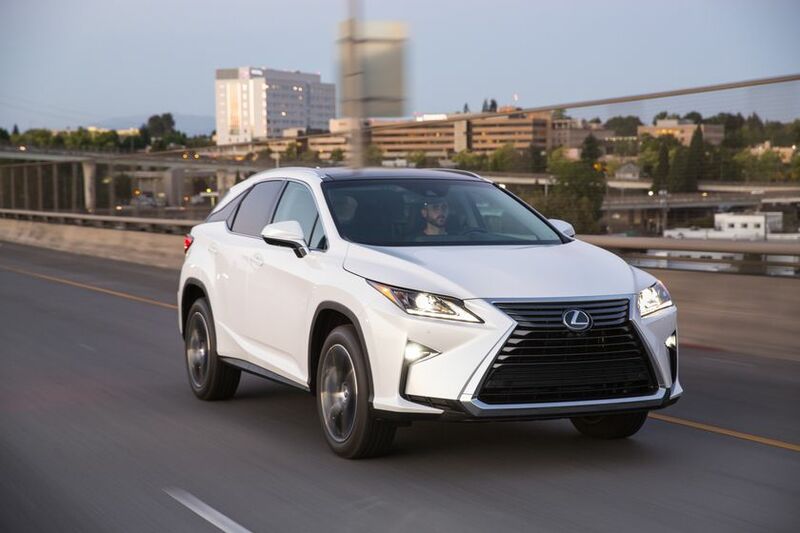 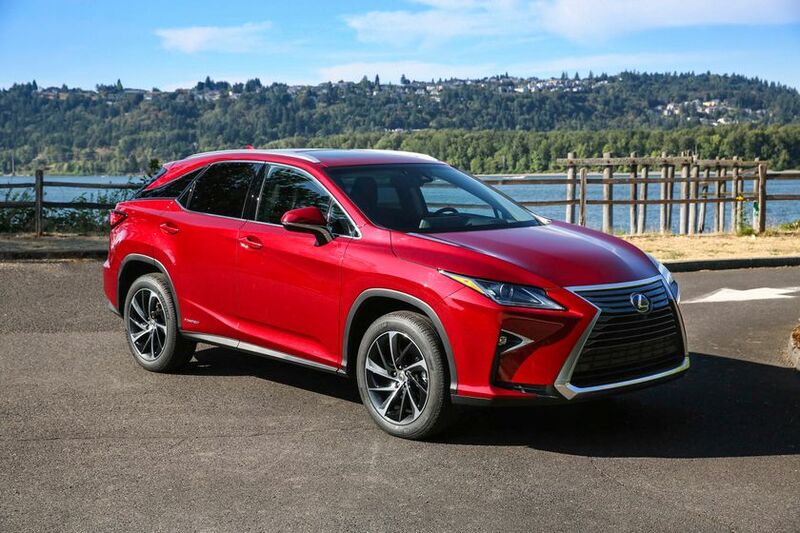 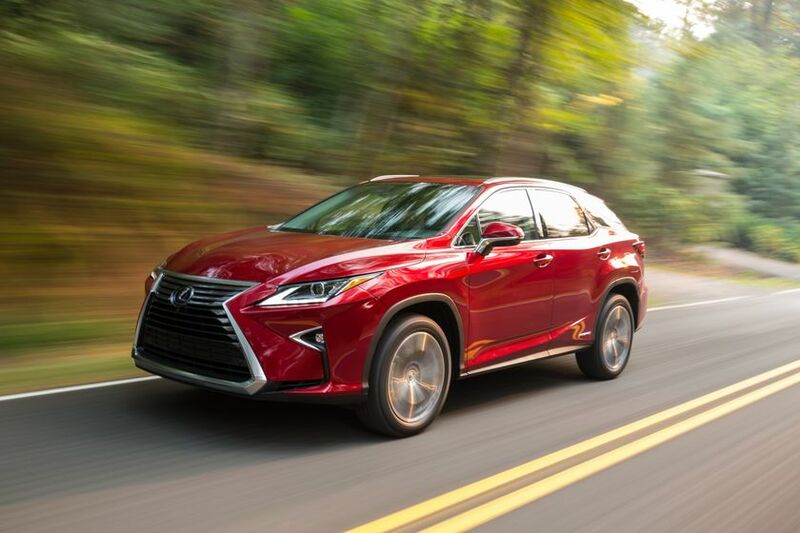 To further improve driving performance as well as feedback to the driver, a number of updates and improvements have been made throughout the structurally sound and highly-refined platform of the all-new Lexus RX. 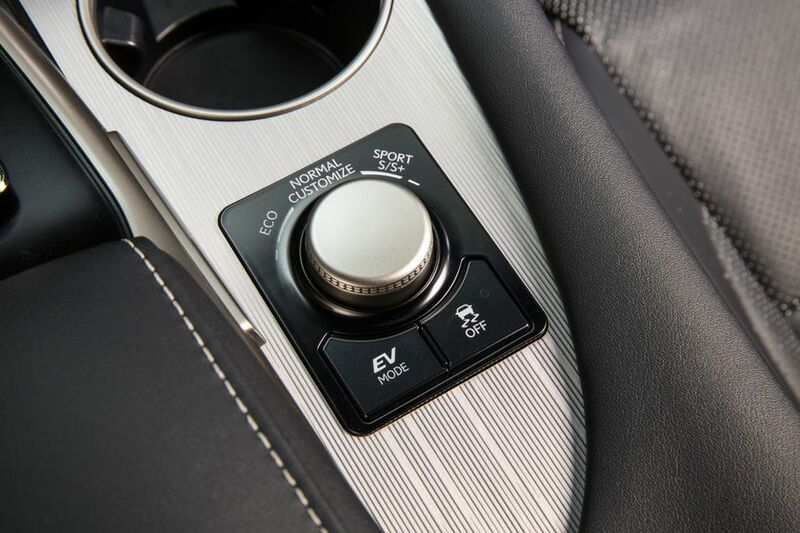 The Electric Power Steering has been further optimized to offer an even more communicative road feel to the driver. 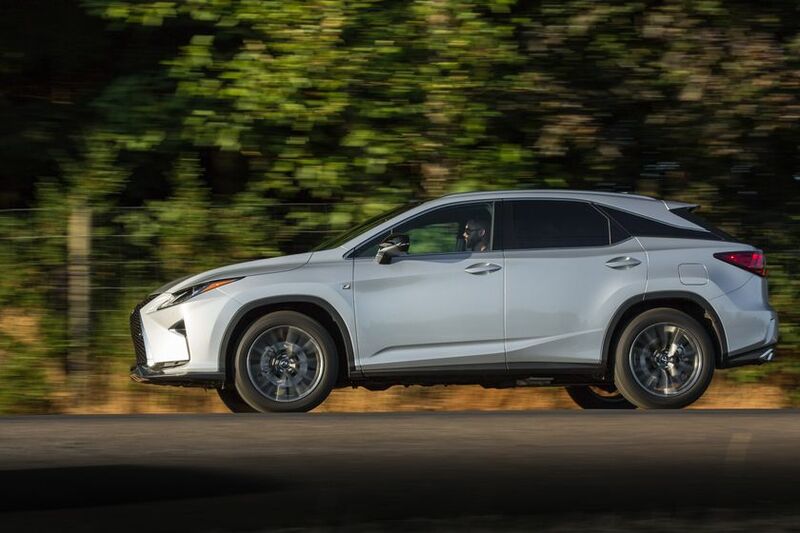 The updated suspension system of the RX, which consists of MacPherson struts up front and a trailing arm/double-wishbone setup at the rear, provides added stability through corners and better overall handling character than its predecessor. 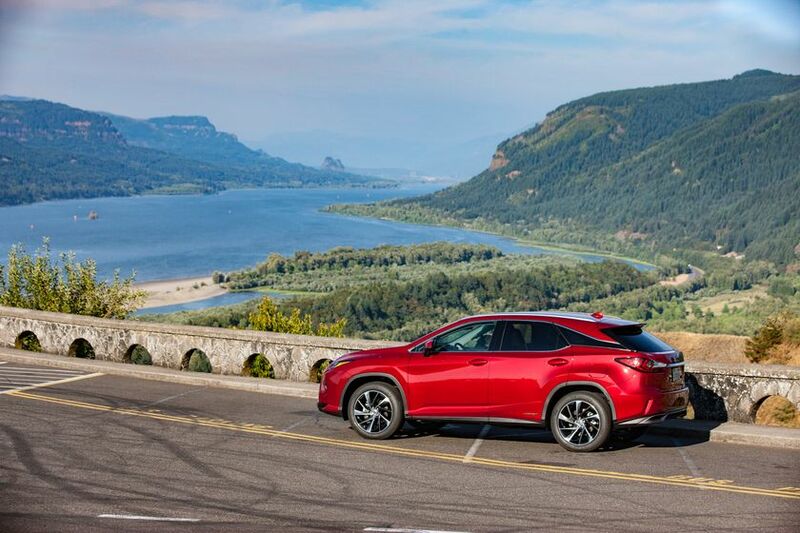 All Lexus RX models are fitted with an enhanced brake system that offers exceptional stopping power and fade resistance. 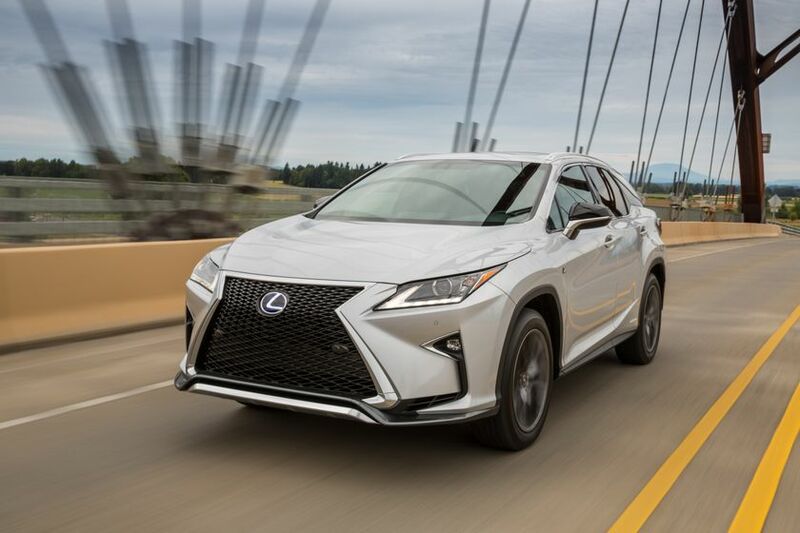 A number of cutting-edge technologies have been applied to the RX’s platform to optimize structural integrity as well as overall rigidity. 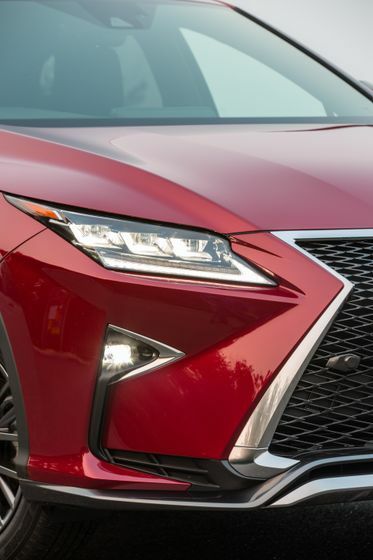 These include: high-tech body adhesives and laser screw welding; liberal use of high-tensile strength steel; the implementation of a new process called “annular frame construction” for strengthened frame sections; and additional spot welds for improved strength and handling stability. 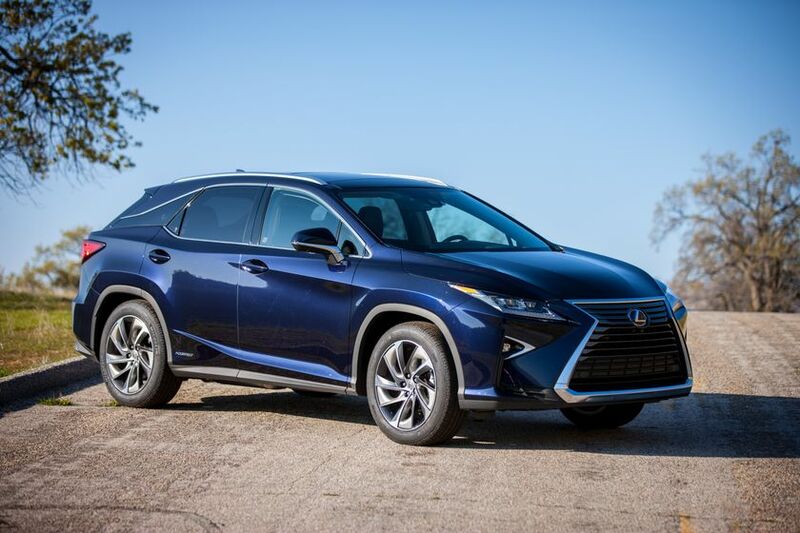 The high-rigidity chassis/body structure of the all-new Lexus RX features a number of design and engineering updates to improve upon the already exceptionally quiet cabin of the previous RX. 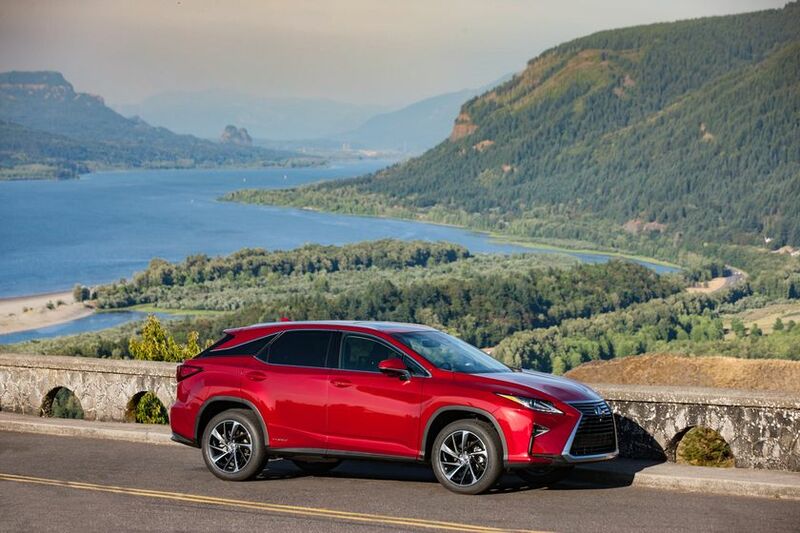 The available Adaptive Variable Suspension system helps the RX to handle like a sports sedan – as well as exhibiting unparalleled ride comfort and stability – by controlling the damping force of the shock absorbers at each individual wheel in response to road surface conditions and driver inputs. 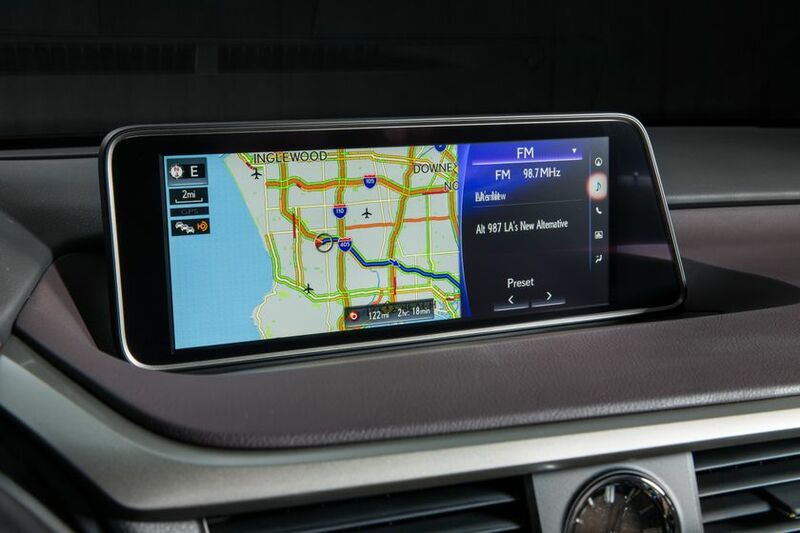 For example, on a rough road the system instantly switches to a more compliant setting to maintain ride comfort. 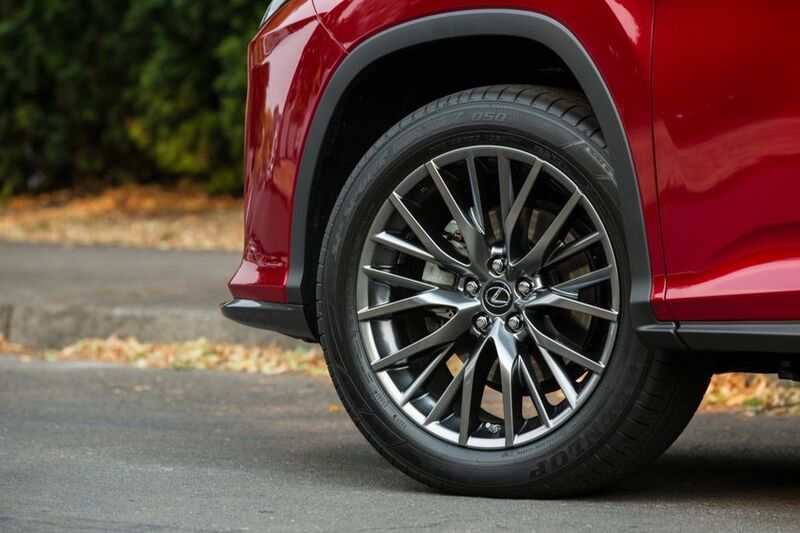 Alternately, when cornering, the damping force firms to help reduce body roll for more performance-oriented, flat cornering. 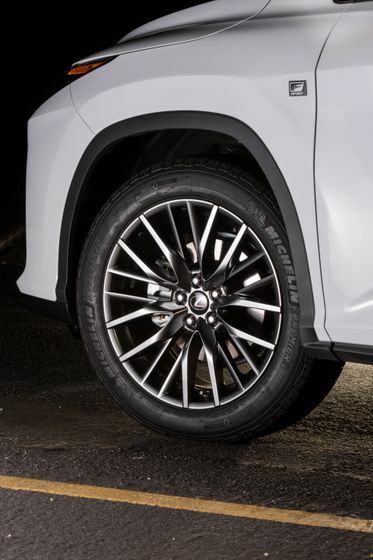 The Active Stabilizer Suspension system suppresses body roll in accordance to the unevenness of the road surface, performing the adjustments not only during turning, but also when traveling straight. 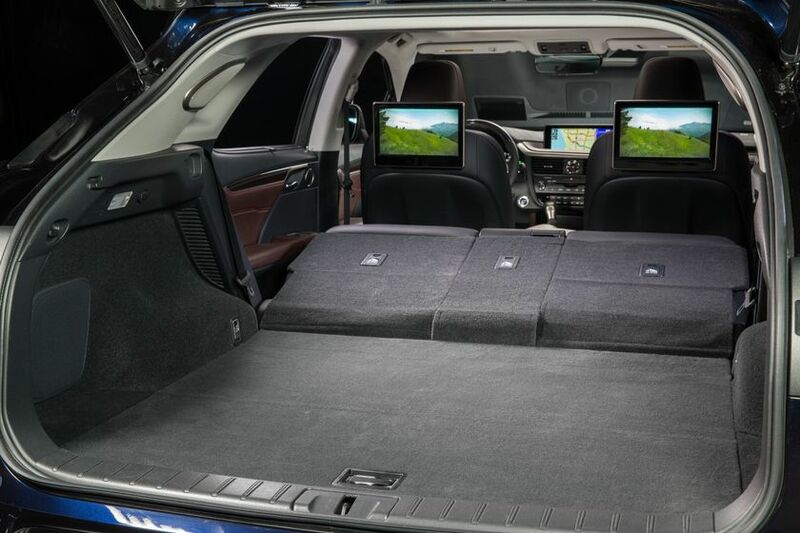 This innovative, active anti-roll system is the first of its kind in the world. 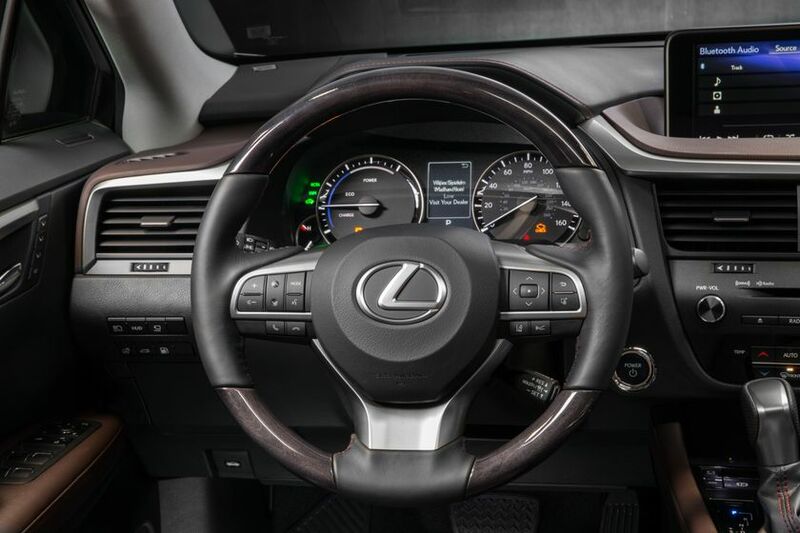 The Drive Mode Select system allows the driver to choose between distinct drive settings depending upon vehicle model. 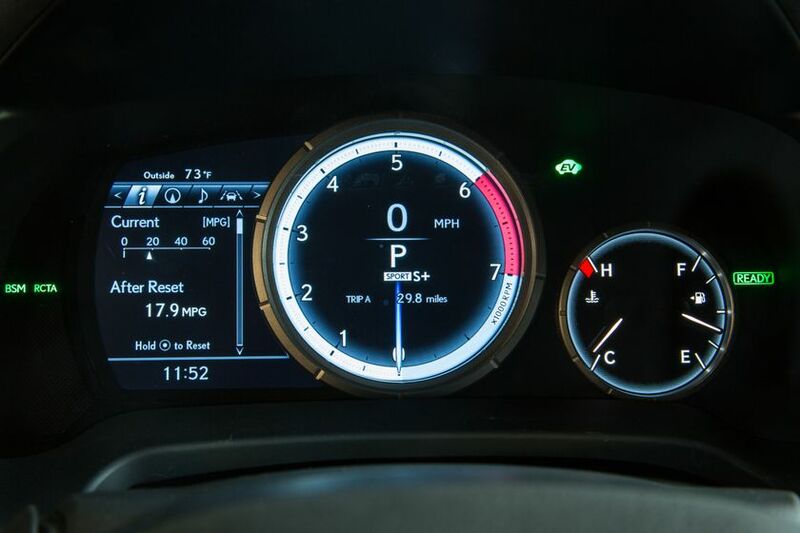 The settings regulate the damping force of the suspension system, adjust engine output, re-map the throttle and modify other key parameters of the engine and chassis. 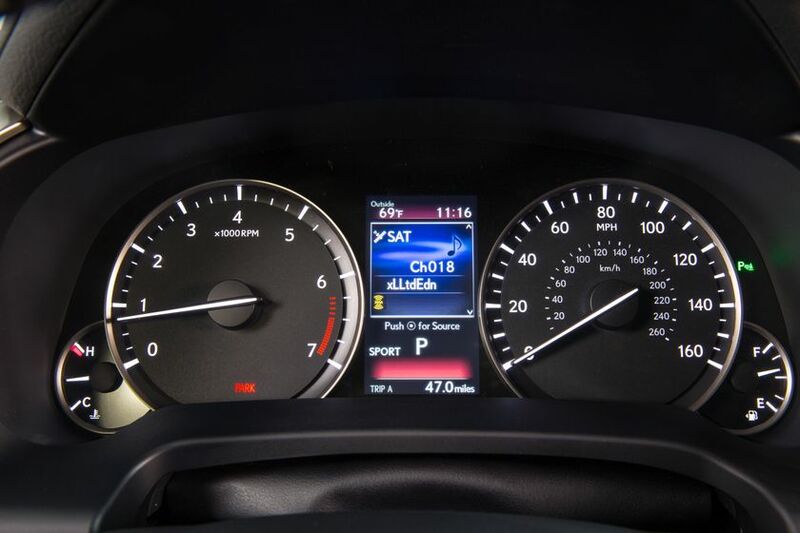 “ECO” mode moderates engine power output, throttle response and the climate control system for increased fuel efficiency. 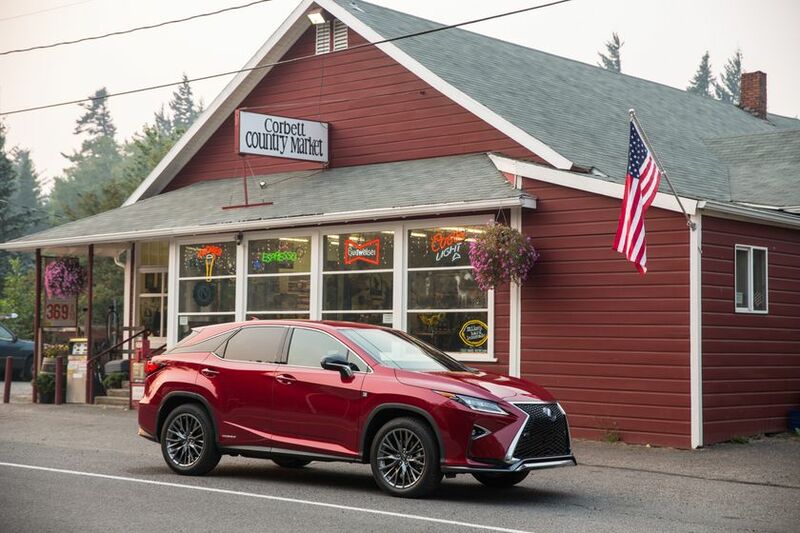 “NORMAL” provides an even balance between engine performance and fuel economy (both “ECO” and “NORMAL” utilize a suspension setting that prioritizes comfort). 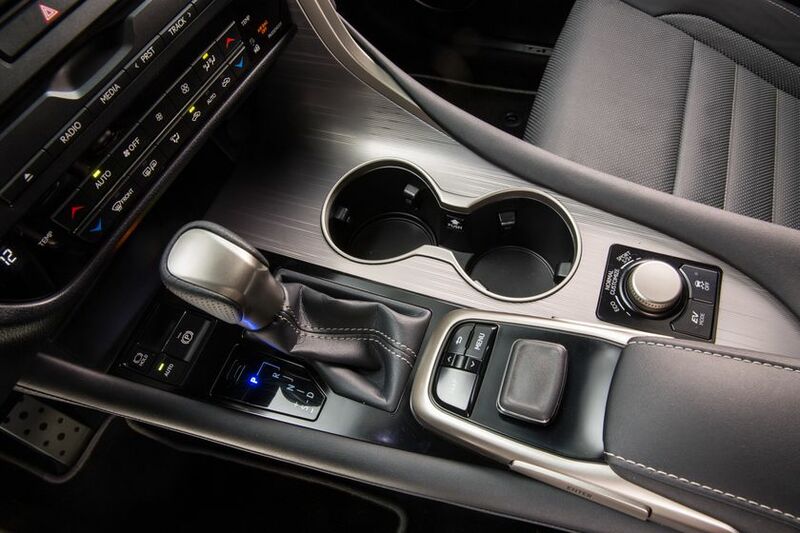 In “SPORT,” the driver is treated to more performance through enhanced throttle response and improved acceleration while sharpening the feel of the Electric Power Steering (EPS) system. 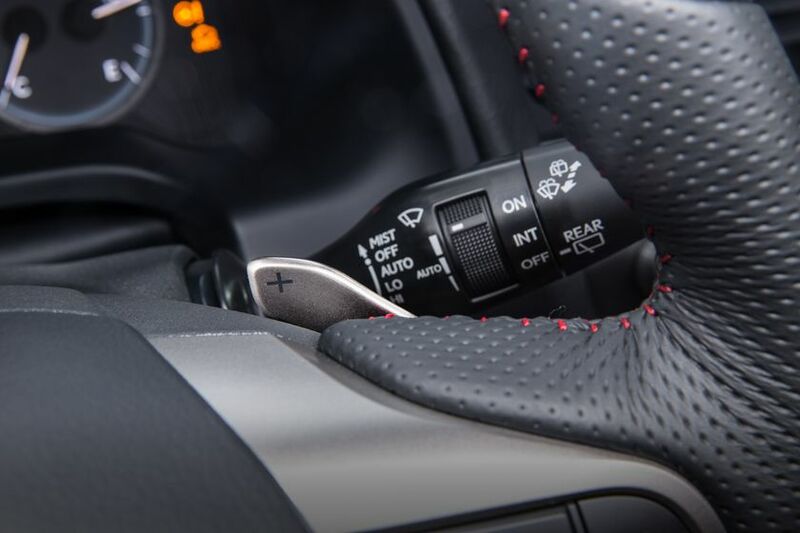 The “SPORT S” setting (available with vehicles equipped with the Adaptive Variable Suspension system) offers even a higher level of performance with aggressive throttle mapping, quicker drivetrain response. 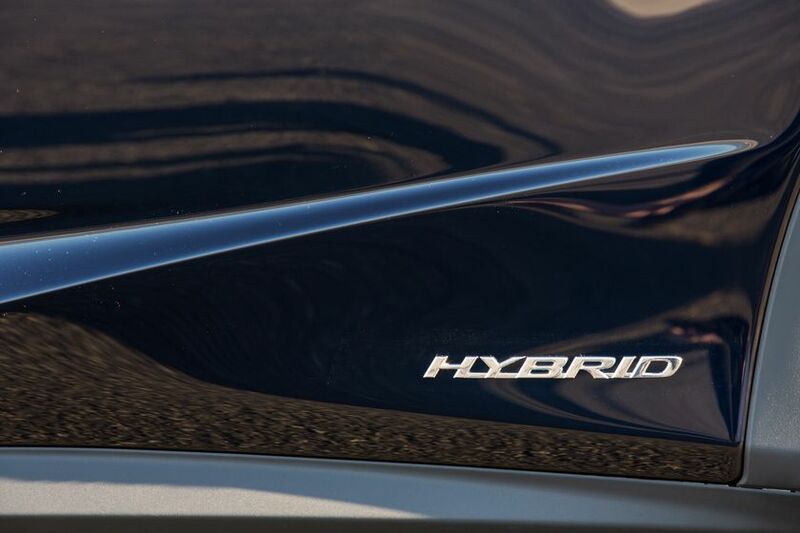 (In hybrid-powered RX models with AVS, this is accomplished when the hybrid system allows for enhanced accelerator response and feeling of more powerful acceleration.) 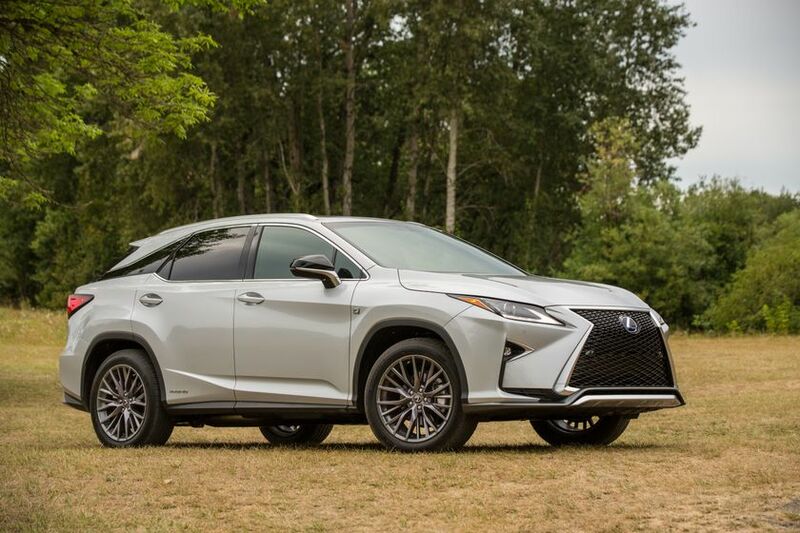 The all-out “SPORT S+” setting combines the powertrain enhancements of the “SPORT S” mode while sharpening the feel of the Electric Power Steering (EPS) system and a stiffer suspension setting for flatter cornering. 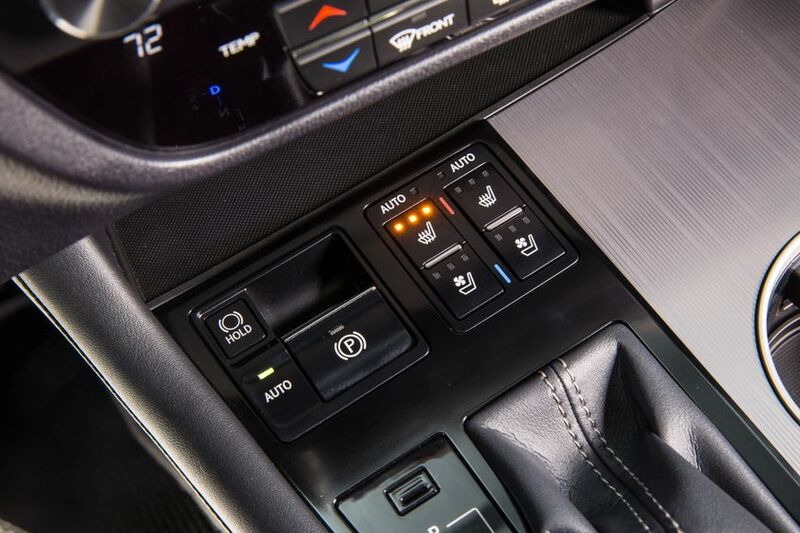 In “CUSTOMIZE,” the driver can individually choose the powertrain and chassis mode. 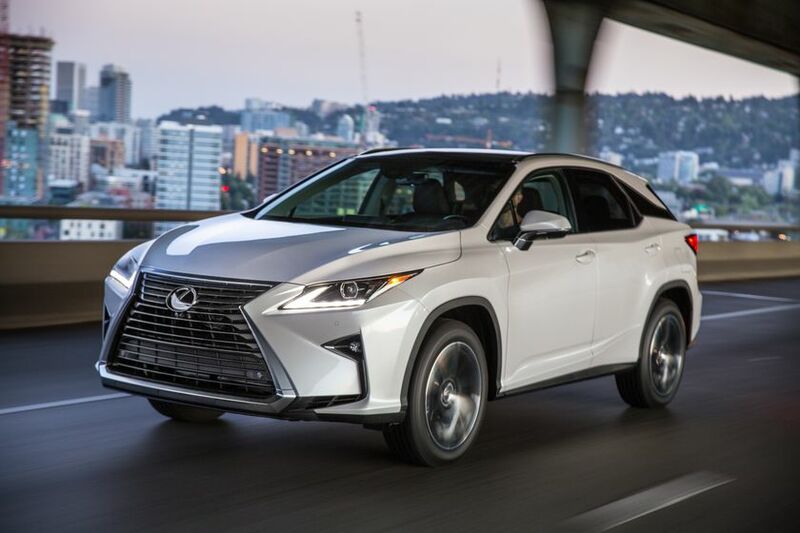 The available F SPORT configurations – offered on the RX 350 and, for the first time, on the RX 450h – elevate the sporty image of the RX to an entirely new level. 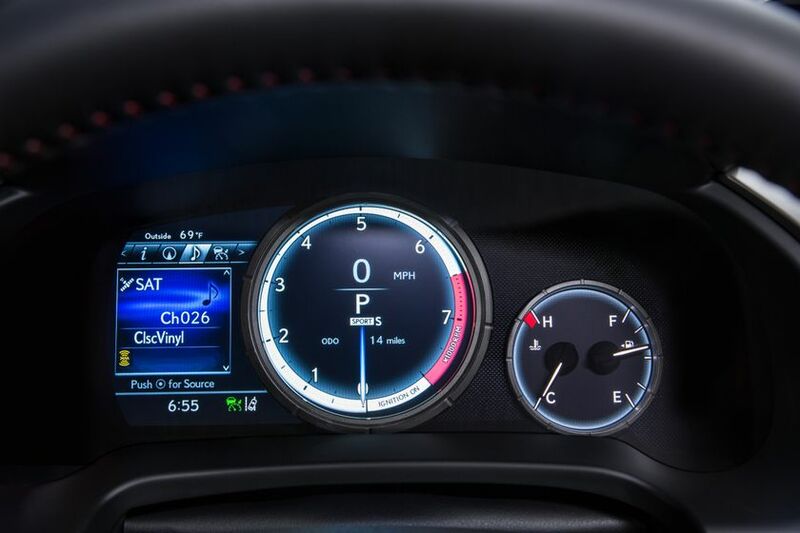 F SPORT models include a number of special visual and performance features that set them apart from other versions. 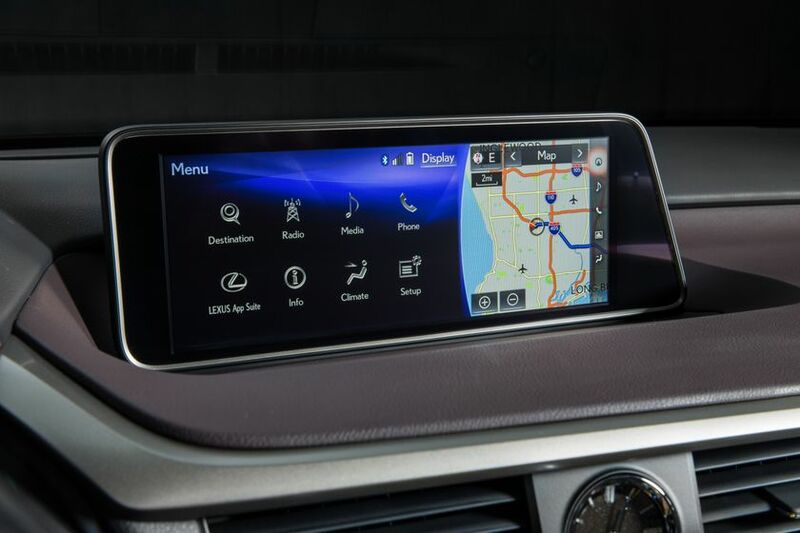 These include an exclusive instrumentation cluster highlighted by an eight-inch Liquid Crystal Display, characterized by a large, easy-to-read circular gauge that artistically combines a tachometer and a digital speed indicator. 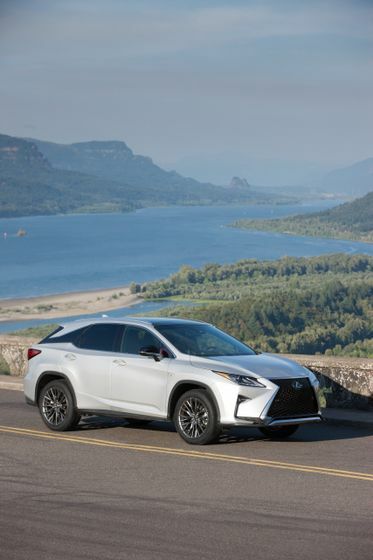 All RX F SPORT models boast excellent handling. 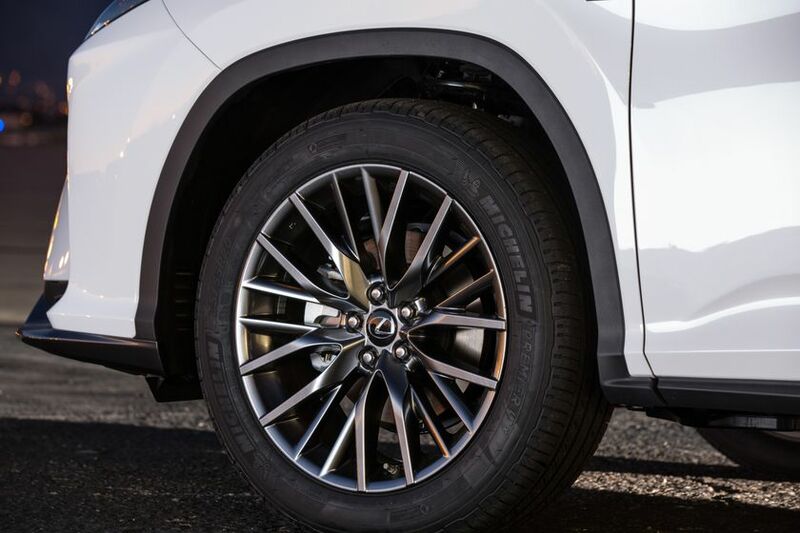 An Adaptive Variable Suspension system controls the damping force of the shock absorbers at each individual wheel in response to road surface conditions and driver inputs. 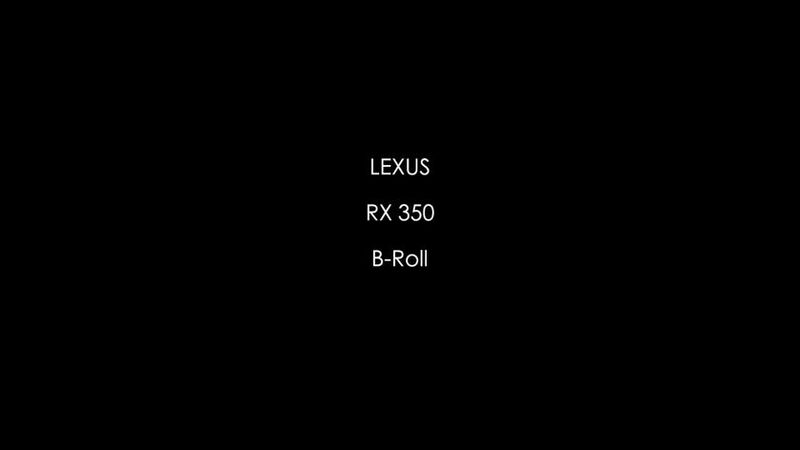 An Active Stabilizer System suppresses body roll in accordance to the unevenness of the road surface. 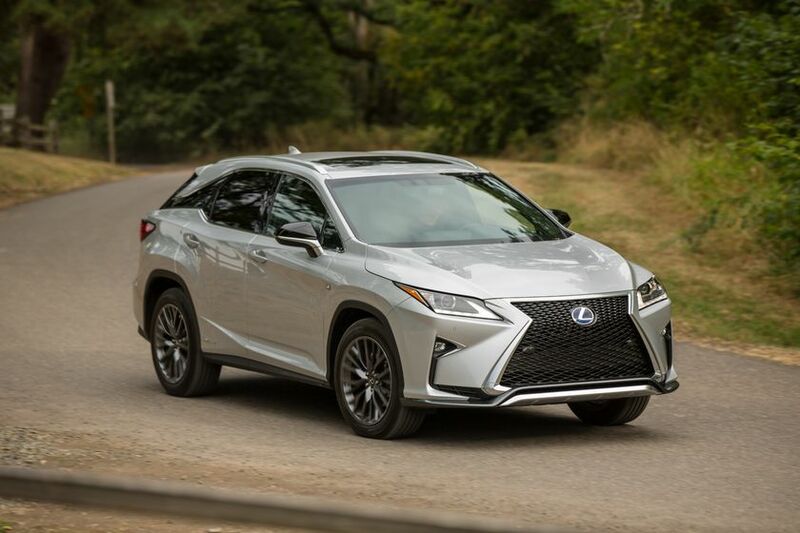 And the sound generator – available on both the RX 350 and RX 450h – enhances the F SPORT driving experience, using air intake pulsations to tune the sound of the engine to produce frequencies that are perceived to be pleasant to the ear during acceleration in the mid- to high-rpm range. 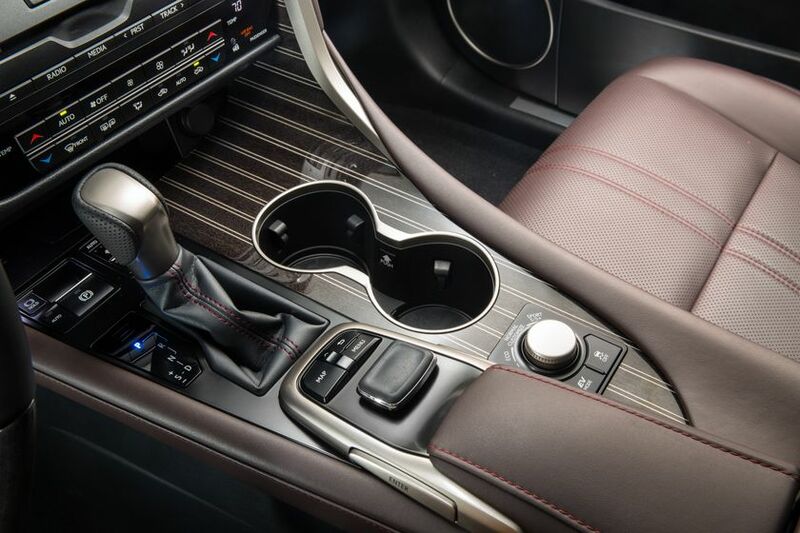 The interior of the RX F SPORT configurations has been styled to match the vehicle’s sporty disposition. 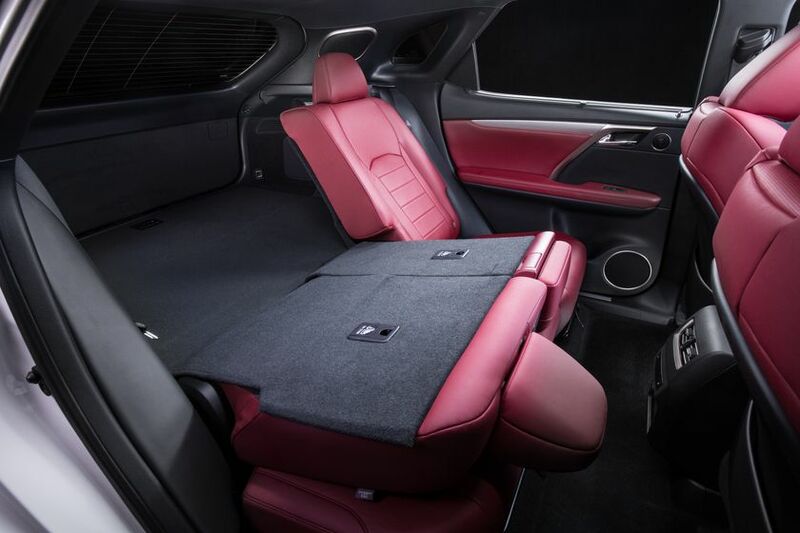 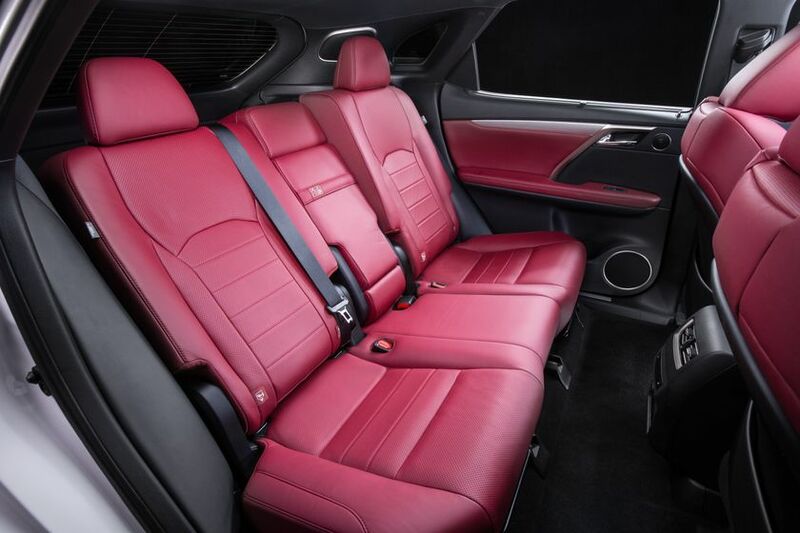 Highly supportive quilted seats are exclusive to F SPORT models. 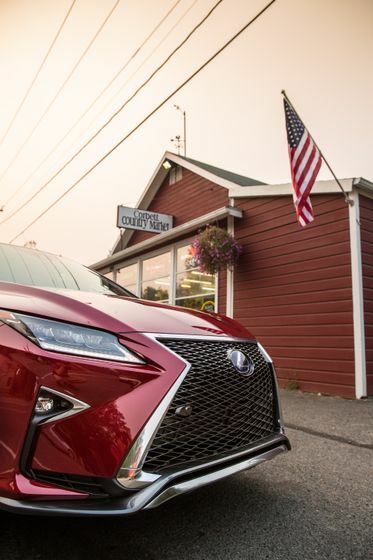 Several unique F SPORT details add extra flair to this exciting model’s invigorating character. 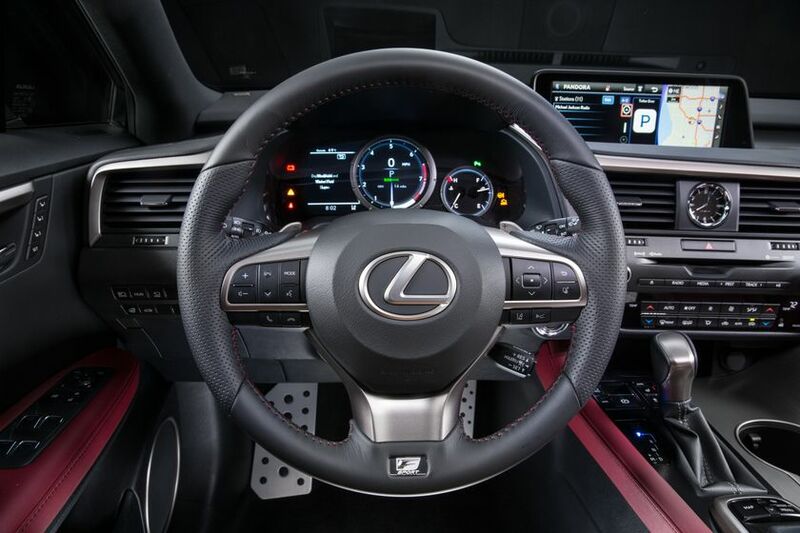 These include a perforated leather-wrapped shift lever and three-spoke sport steering wheel with F SPORT badge, aluminum interior trim accents, and drilled non-slip lightweight aluminum accelerator and brake pedals and foot rest. 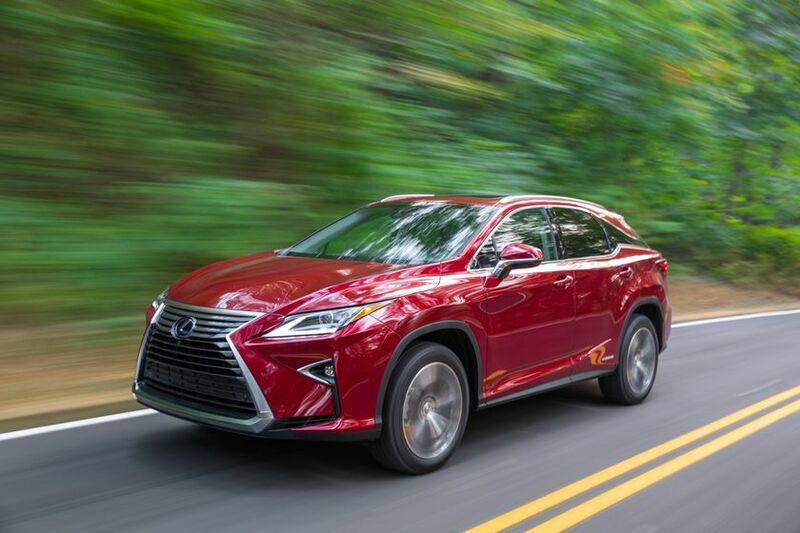 A plethora of vital safety features and technologies are included on all RX models – including 10 airbags, a Direct Tire Pressure Monitor System with available tire inflation display function, vehicle theft-deterrent system, and engine immobilizer system. 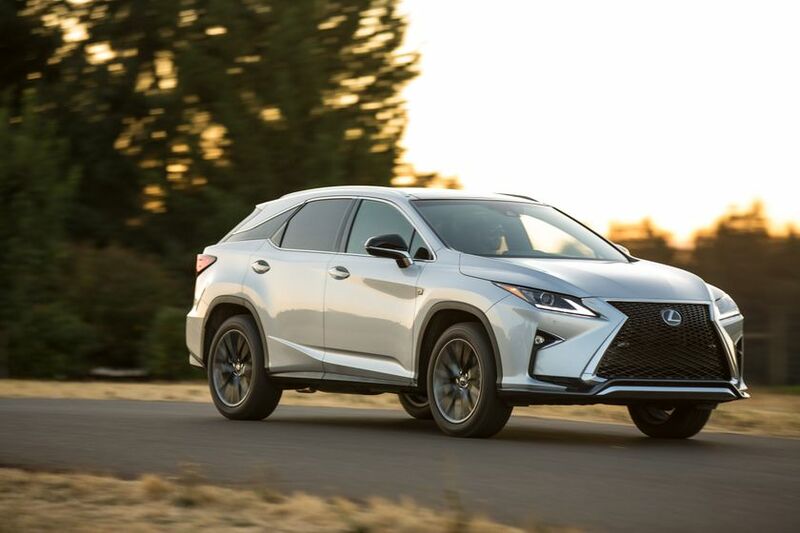 Braking and traction control systems include: four-wheel ventilated power assisted disc brakes; a four-sensor, four-channel Antilock Braking System with Electronic Brake force Distribution and Brake Assist; Traction Control; Vehicle Stability Control; and Hill-start Assist Control. 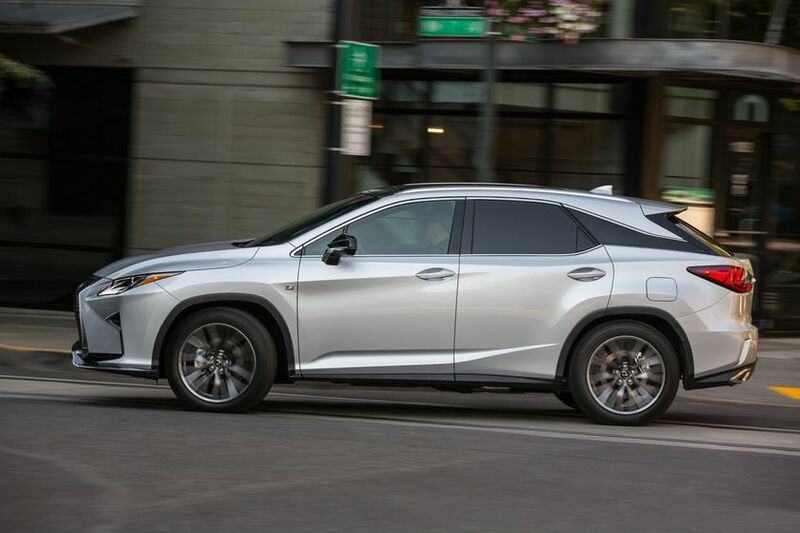 The available Lexus Safety System + helps drivers to avoid or mitigate collisions across a wide range of vehicle speeds. 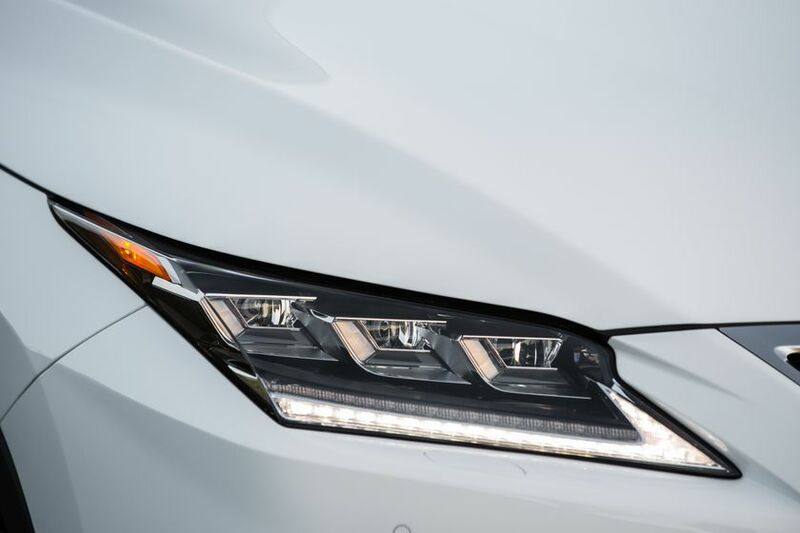 This system includes: Pre-Collision System, Lane Departure Alert, Automatic High Beam, and Dynamic Radar Cruise Control. 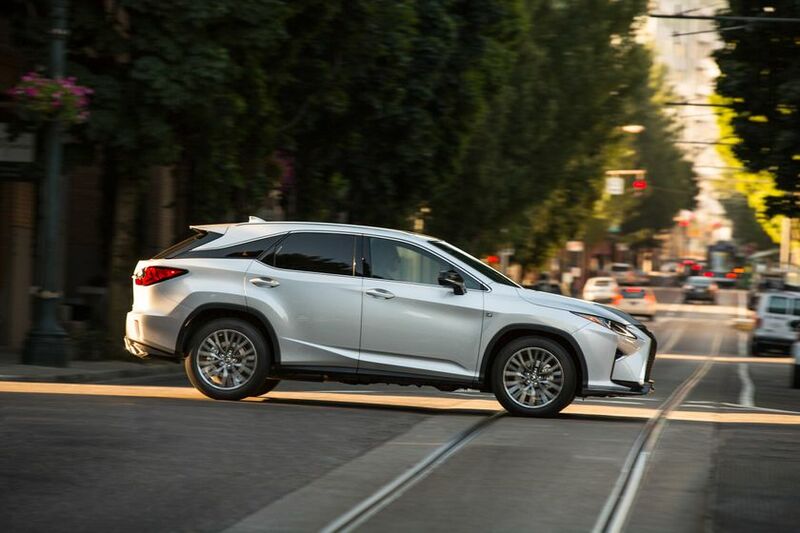 Using both a camera and millimeter-wave radar, the Pre-Collision System detects other vehicles in front of the RX. 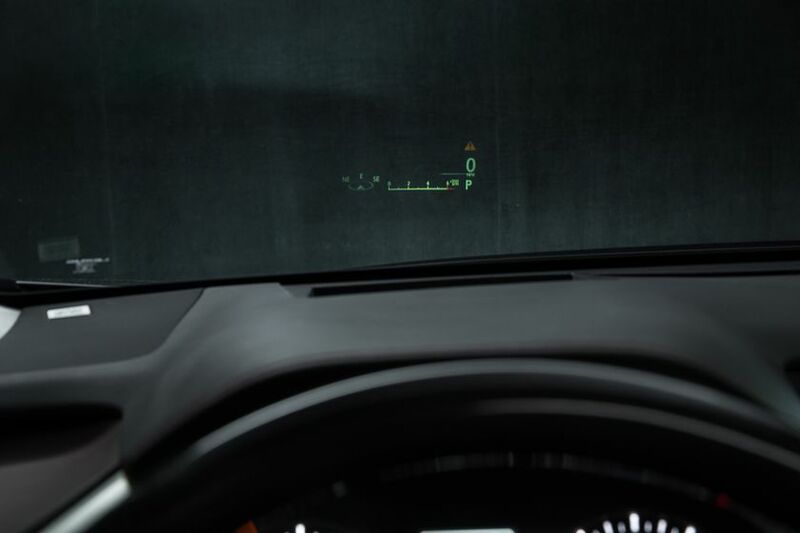 If the system judges there is the possibility of a collision, a warning is activated so the driver may perform evasive maneuvers. 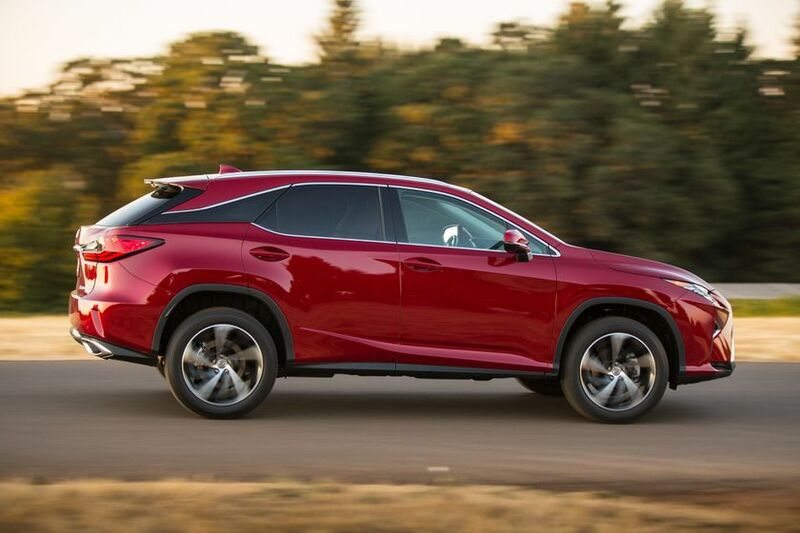 After the warning, the amount of additional brake pressure provided when the driver depresses the brake pedal is increased in stages according to the level of possibility of a collision. 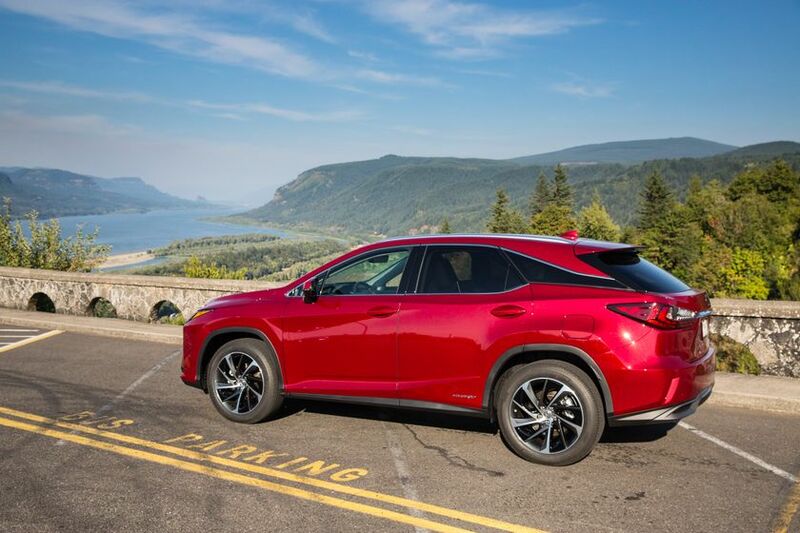 Additionally, if the system judges there is a high probability of a collision, it automatically activates the brakes, helping to avoid the collision or mitigate the impact force to occupants and the vehicle. 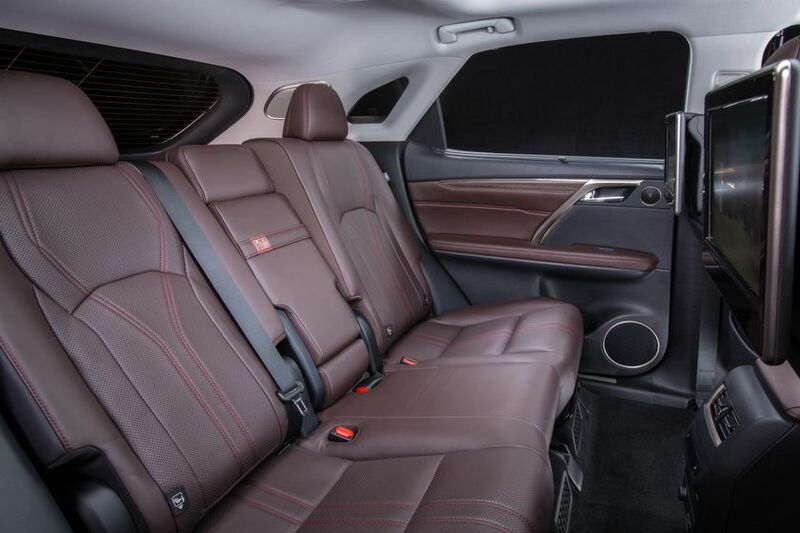 The Luxury Package ($61,550) adds premium leather seating, Voice-activated HDD Navigation with Remote Touch, 10-way power adjustable front row seats, a woodgrain and leather wrapped steering wheel, 20-inch aluminum alloy wheels, a rear door sunshade, illuminated LED front door scuff plates, 12.3-inch colour display screen, auto-recirculation air conditioning, clearance and backup sensors, L-shaped premium LED headlamps and rear combination lamps. 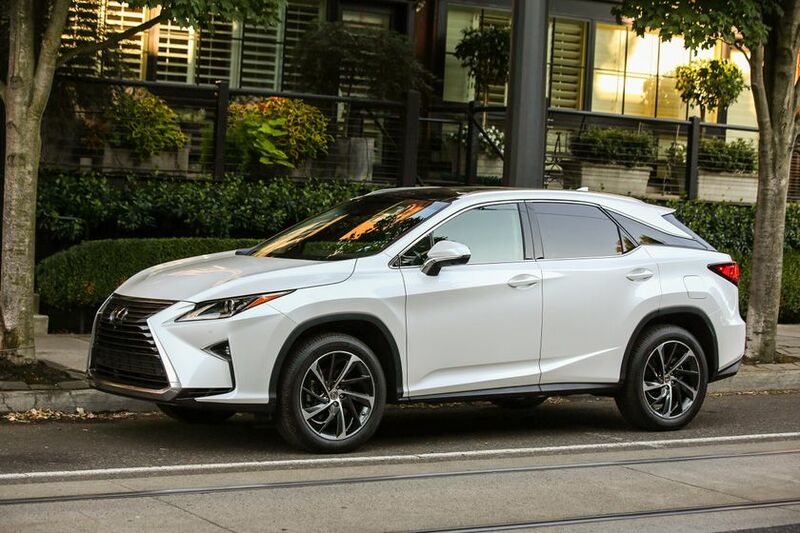 The Executive Package ($68,000) builds on the Luxury Package, adding a panoramic roof, panoramic view monitor,hands-free power back door, 15-speaker Mark Levinson Audio system, the Qi wireless charger, power rear folding seats, and a number of Lexus safety technologies and driver aids, including Head-Up Display, pre-collision system, adaptive cruise control, Automatic High Beams, and Lane Departure Alert. 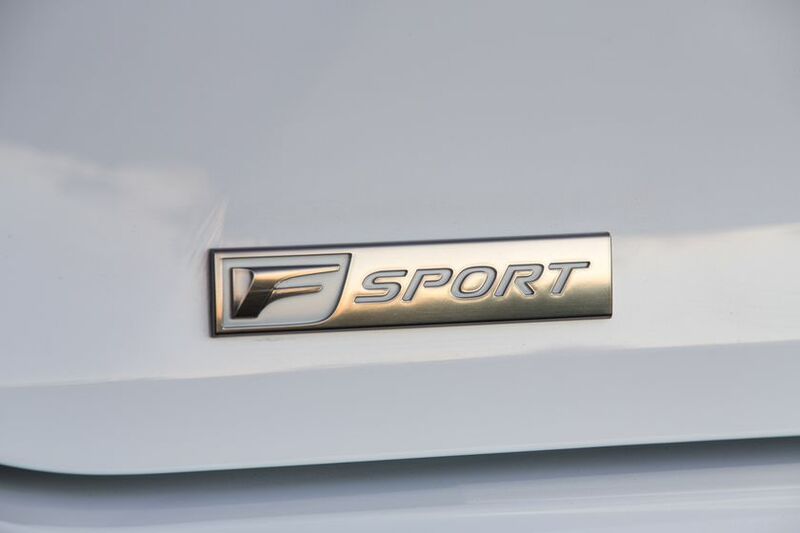 The F SPORT Series 2 ($62,700) package adds several exclusive F SPORT styling enhancements, including unique 20-inch aluminum alloy wheels, front grille, shift knob, seats and scuff plates. 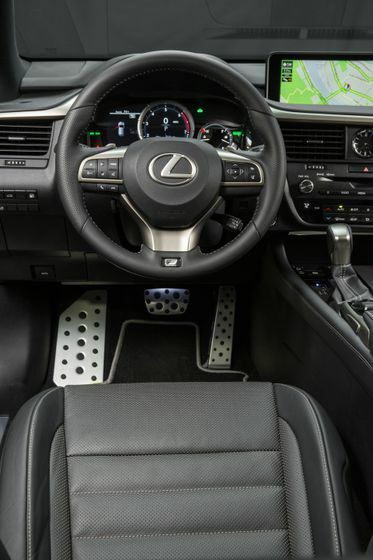 It also adds aluminum sport pedals with rubber inserts and Vehicle Dynamics Integrated Management, plus F SPORT leather seating, 10-way power adjustable front row seats, a leather steering wheel with paddle shifters, Adaptive Variable Suspension with Sport S+ mode, and Vehicle Dynamic Integrated Management. 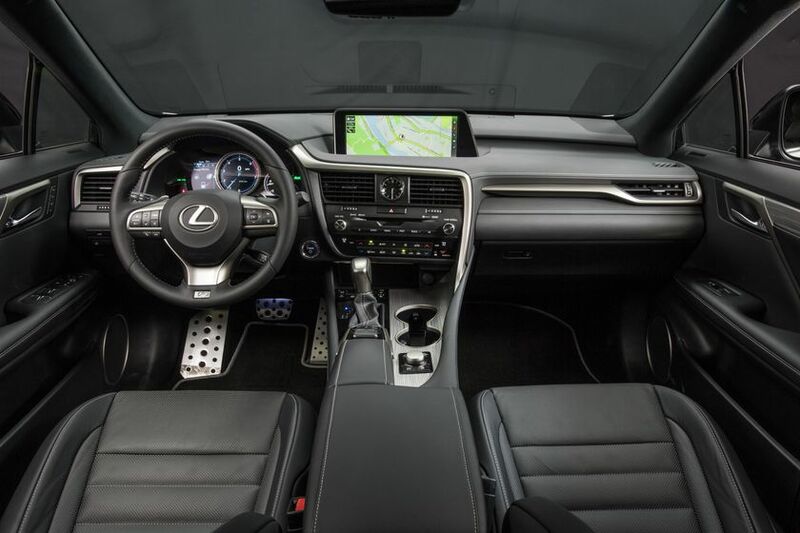 The F SPORT Series 3 ($68,000) package builds on Series 2, adding a panoramic roof, panoramic view monitor, hands-free power back door, 15-speaker Mark Levinson Audio system, the Qi wireless charger power rear folding seats, and a number of Lexus safety technologies and driver aids, including Head-Up Display, pre-collision system, adaptive cruise control, Automatic High Beams, and Lane Departure Alert. 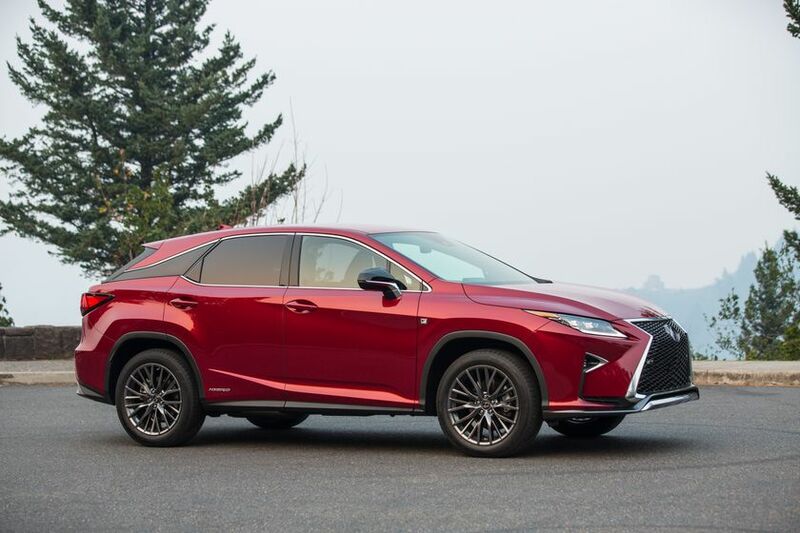 The Executive Package ($75,000) adds a panoramic roof, panoramic view monitor, hands-free power back door, 15-speaker Mark Levinson Audio system, the Qi wireless charger, power rear folding seats, and a number of Lexus safety technologies and driver aids, including Head-Up Display, Pre-Collision System, Adaptive Cruise Control, Automatic High Beams, and Lane Departure Alert. 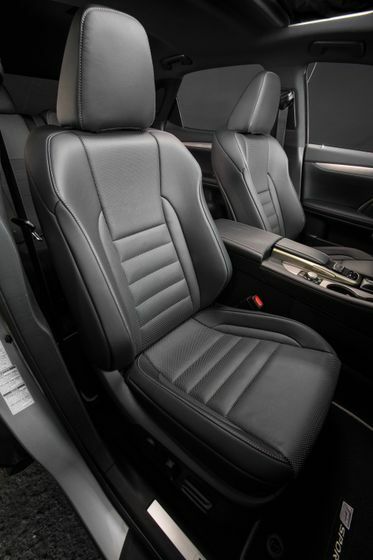 The Executive Plus Package ($77,550) further enhances the Executive Package, adding a rear seat entertainment system 11.6” LCD display screens and wireless headphones. 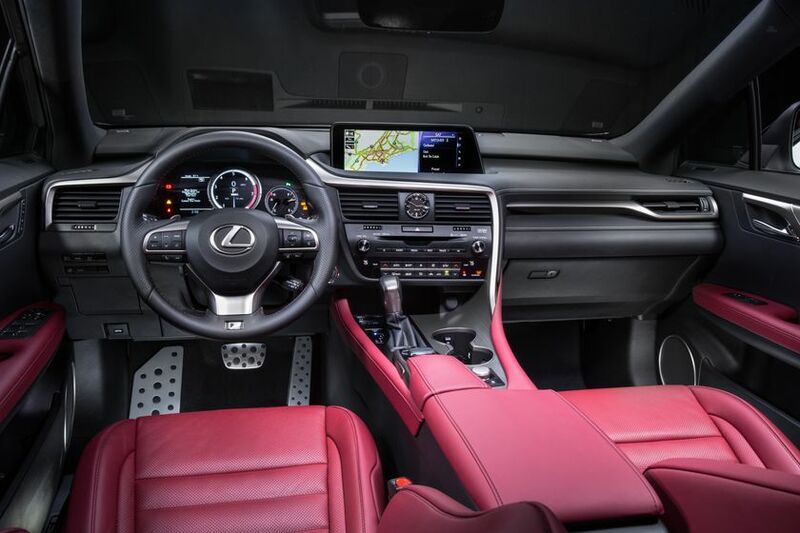 The F SPORT Series 3 ($75,800) package adds several exclusive F SPORT styling enhancements, including unique 20-inch aluminum alloy wheels, front grille, shift knob, seats and scuff plates. 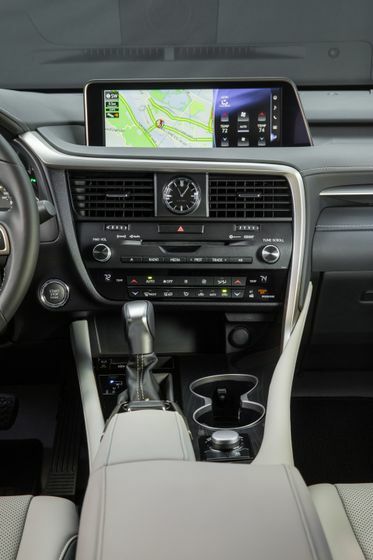 It also adds aluminum sport pedals with rubber inserts and Vehicle Dynamics Integrated Management, plus a panoramic roof, panoramic view monitor, touchless, hands-free power back door, 15-speaker Mark Levinson Audio system, the Qi wireless charger, power rear folding seats, and a number of Lexus safety technologies and driver aids, including Head-Up Display, Pre-Collision System, Adaptive Cruise Control, Automatic High Beams, and Lane Departure Alert. 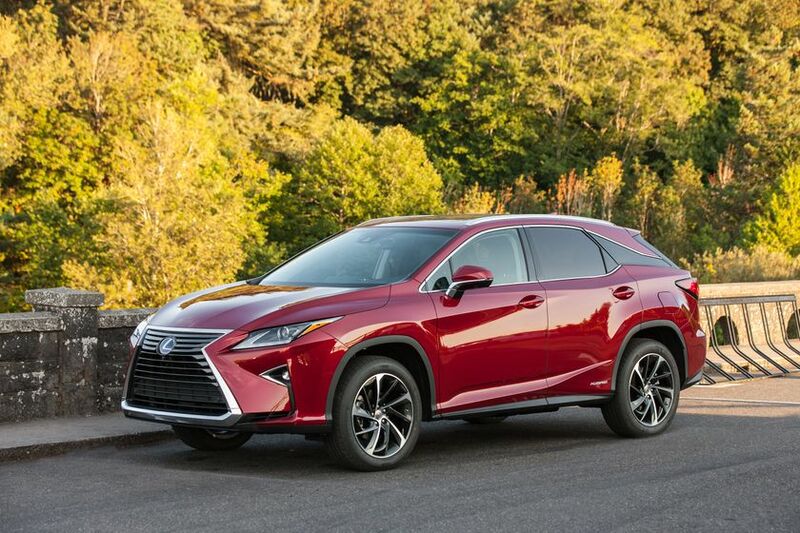 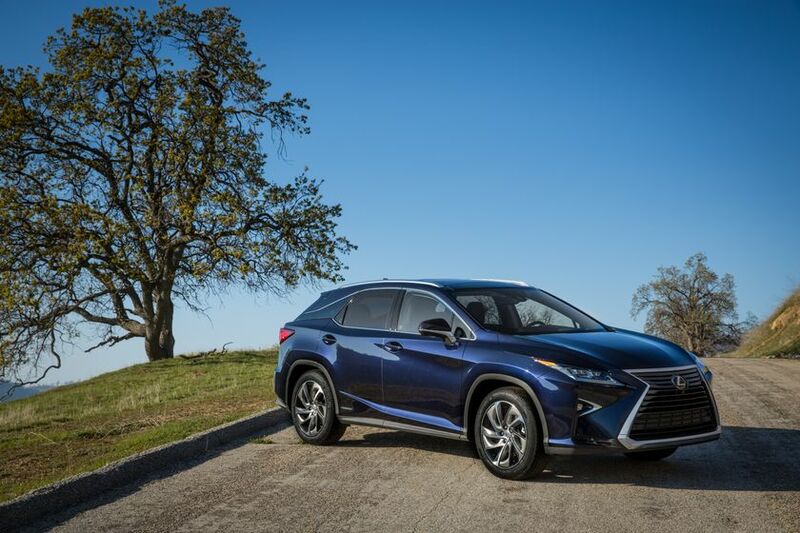 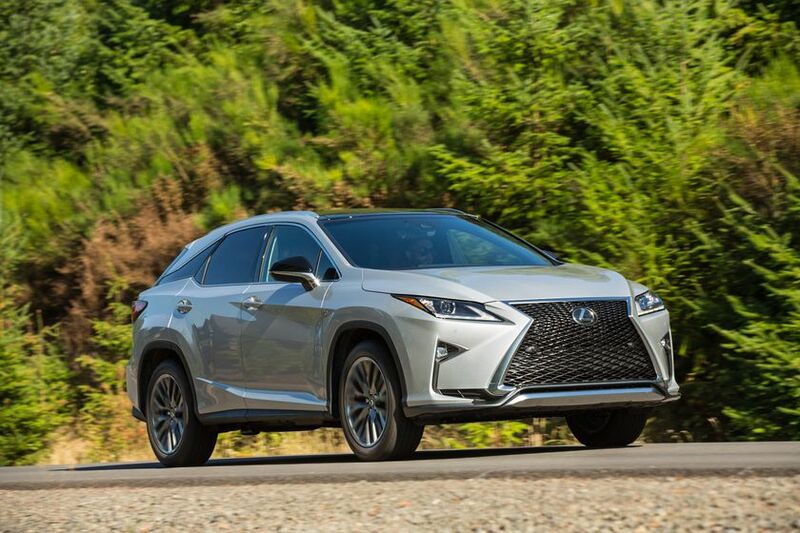 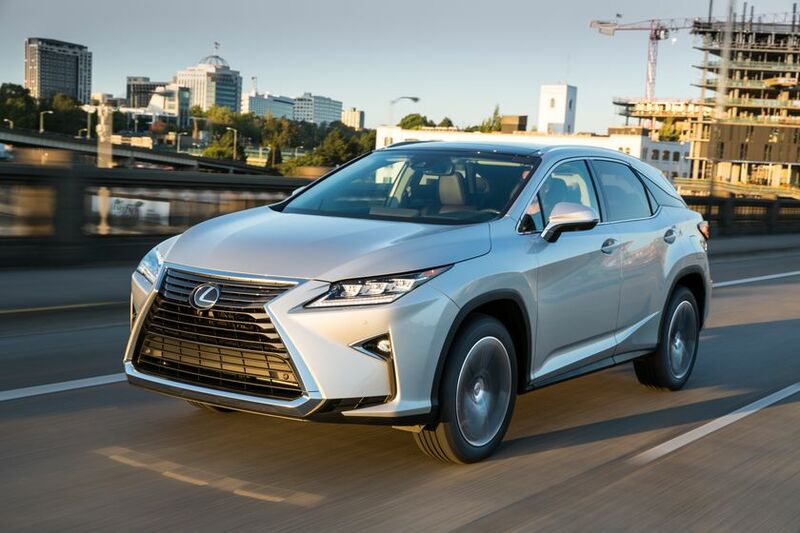 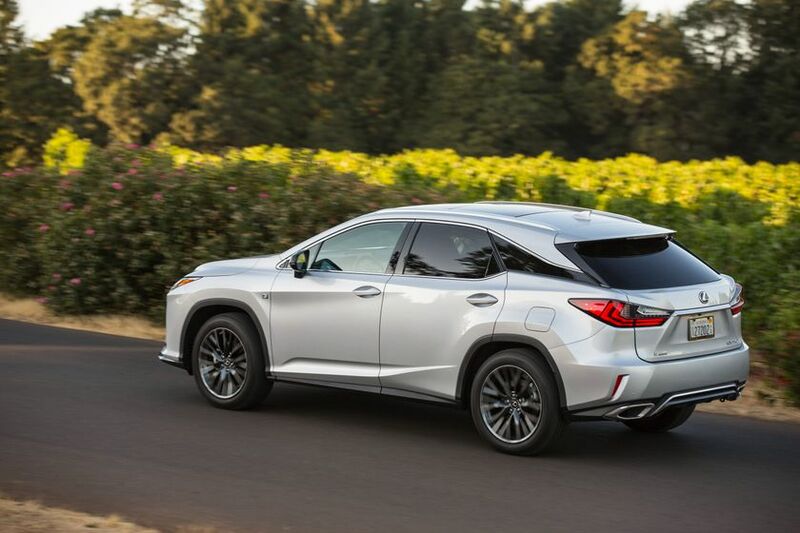 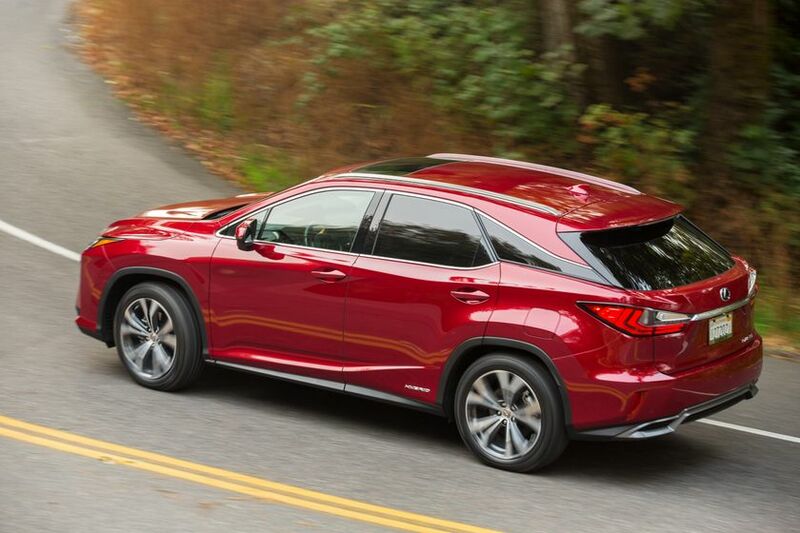 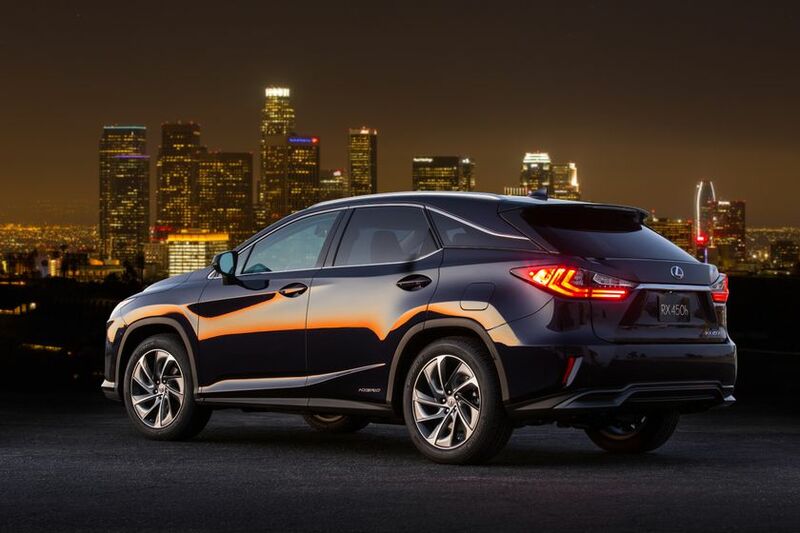 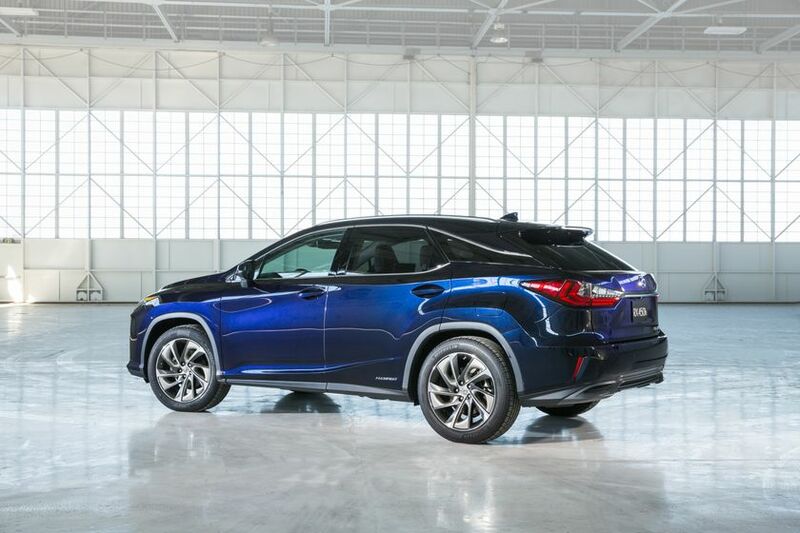 The 2016 Lexus RX goes on sale late Fall at Lexus Dealers across Canada. 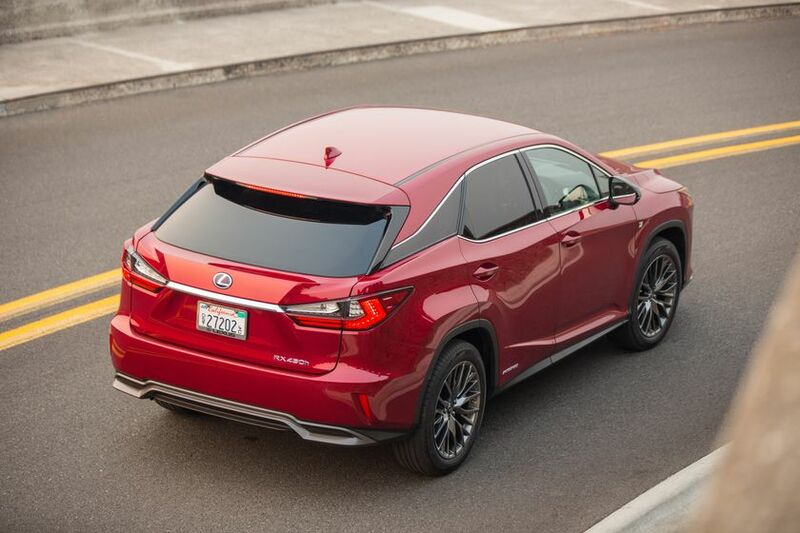 Pricing will be revealed closer to the on-sale date. 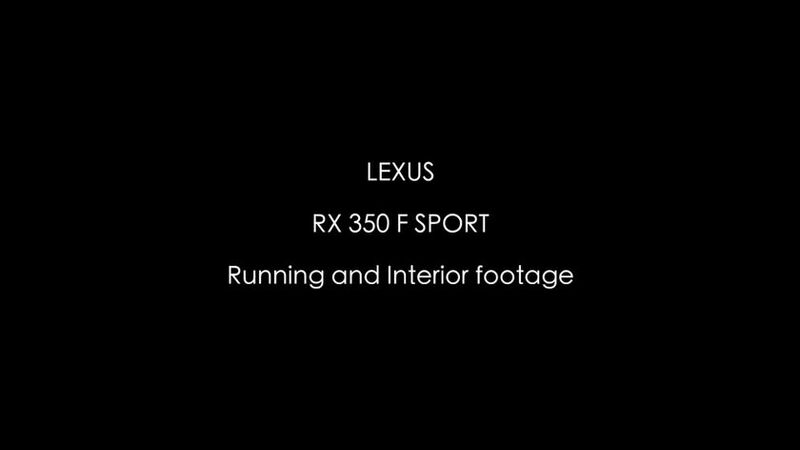 For more information on features and specifications, visit www.lexus.ca/future-models.